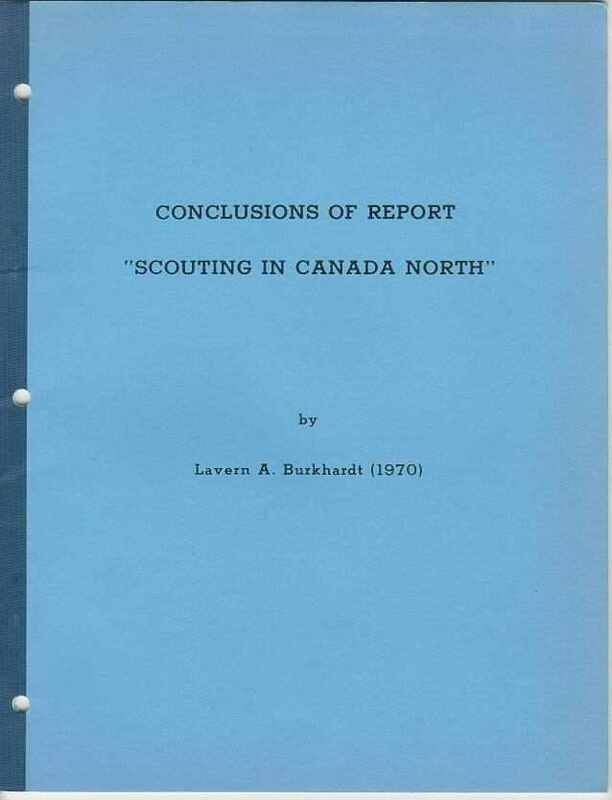 The following inventory of all known Scouting artifacts from the NWT makes no claim as to being the complete and final listing. Any additions and corrections are welcome and will be gratefully acknowledged. Scans of any missing items would also be greatly appreciated. 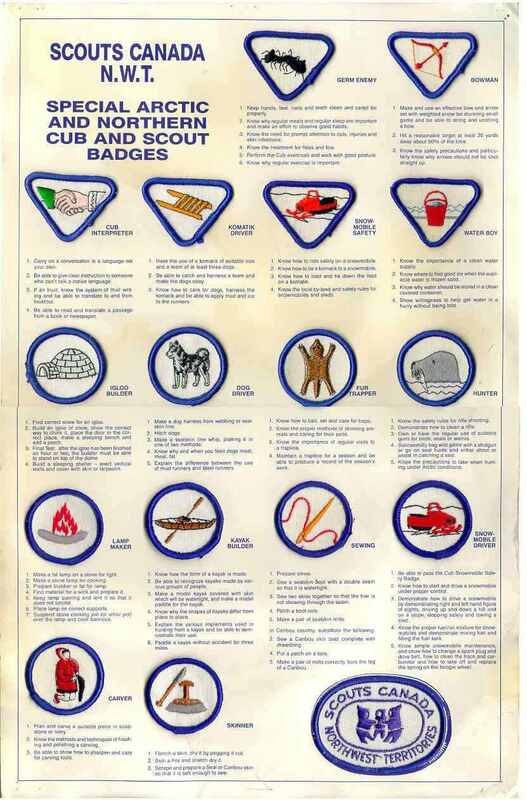 Badge descriptions are from The Canadian Badgers Club Catalog, corrected where necessary. All unlisted badges are described using the same criteria. Items highlighted in red are either on scouteralf's wantlist or for completion of Council's collection. If you would like to sell or trade, please email me. 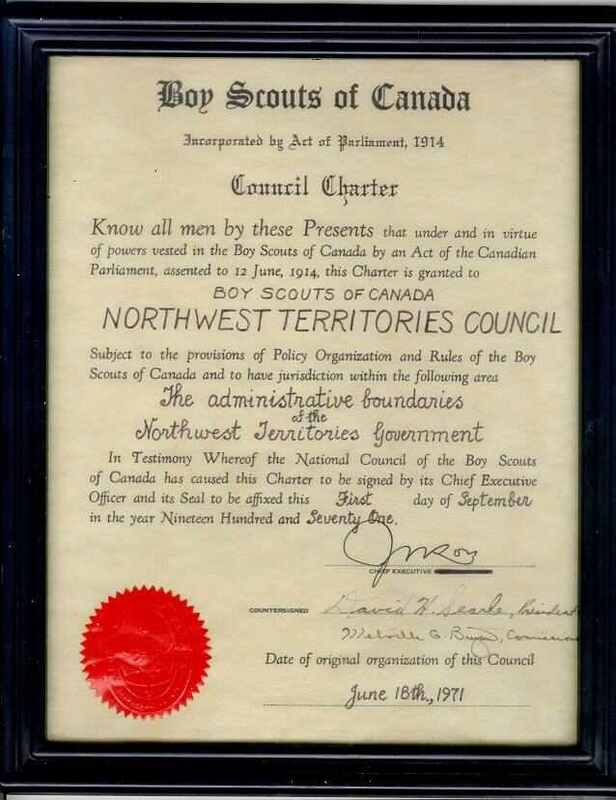 Signed by members of the 5th Alberta Troop which included Scouts from Aklavik, NWT. These signatures were then embroidered over by hand. 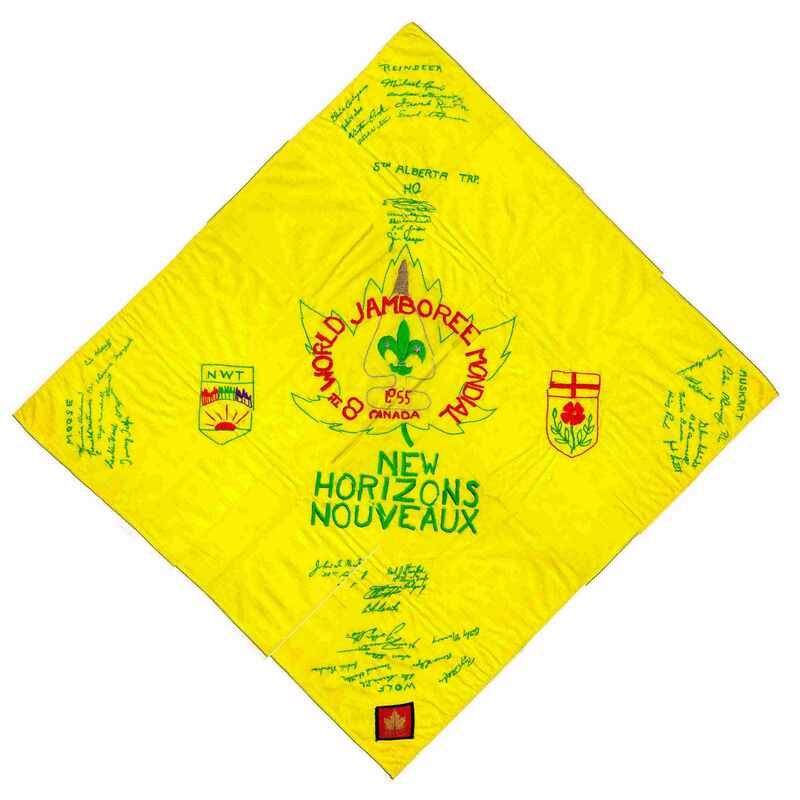 Chuck Cripps (the Aklavik Scout Leader) believed that this necker had been lost years ago, but it was recently found in the NWT and Nunavut Scout Council files in Yellowknife. 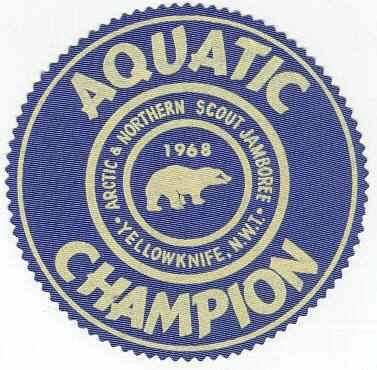 Aquatic Champion. 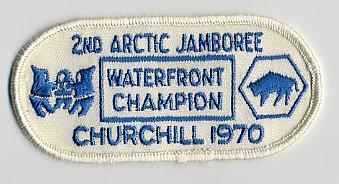 (unlisted) Silk screened, Circular 120mm dia; "AQUATIC CHAMPION ARCTIC & NORTHERN JAMBOREE YELLOWKNIFE 1968"
This certificate was presented to Barbara Bromley, who organized the Medical Services for the Arctic and Northern Jamboree. The Bromley house also served as a drop in center for the Jamboree staffers. Badge. Version ALTA Jam 10a. 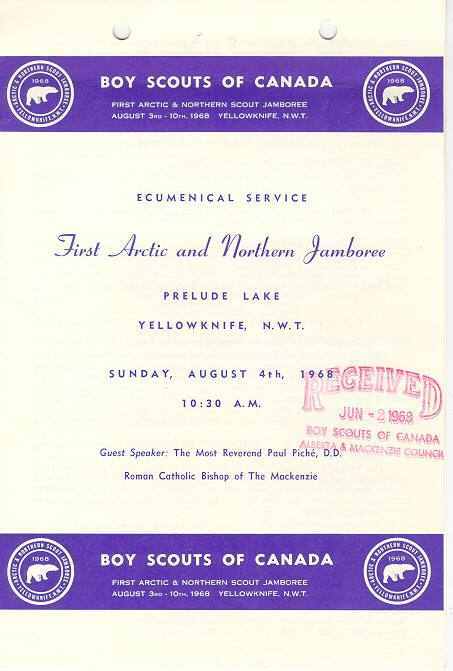 Swiss, Rolled edge, Circular; "ARCTIC & NORTHERN SCOUT JAMBOREE YELLOWKNIFE N.W.T. 1968". 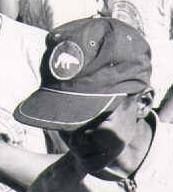 This is considered an Alberta badge by the Canadian Badgers Club because the Alberta Council was overseeing Scouting activities in the Northwest Territories at this point in time. Issued a both a souvenir and for purchases at the Jamboree canteen. Necker. 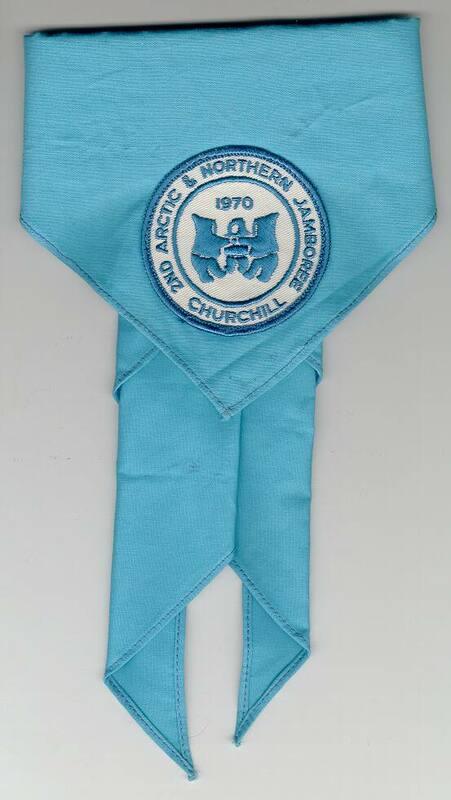 Each Jamboree participant was issued a necker as part of their official uniform for the event. Leather Plaque available at the Tandy Leather craft area. 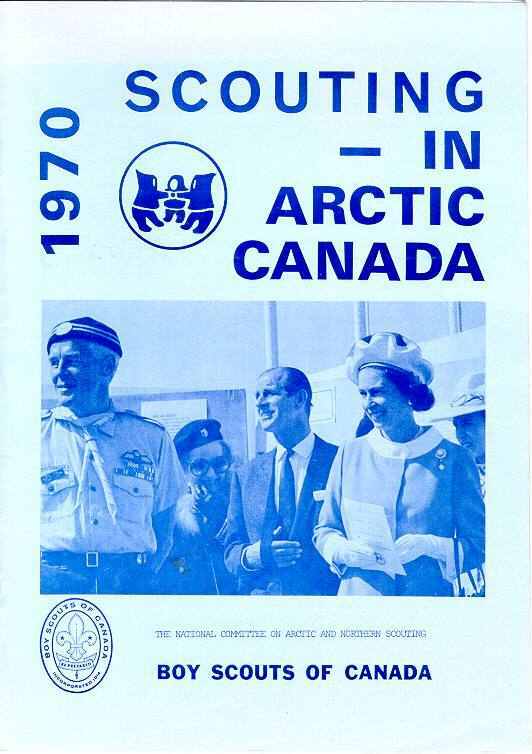 Program Button: "I've Been North of 60". Touque with touque badge ALTA Jam 10/1a. Necker. 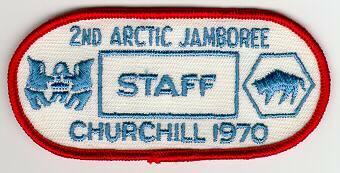 Each Jamboree participant was issued a touque as part of their official uniform for the event. 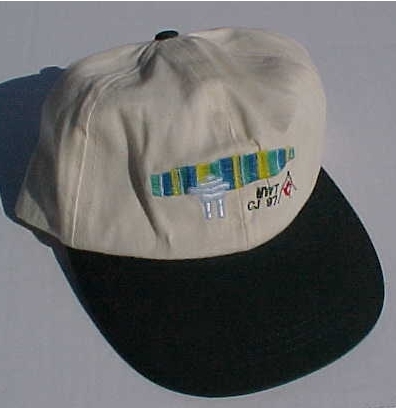 Touque Badge. Version ALTA Jam 10/1a. 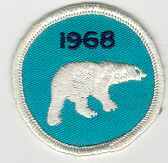 Swiss, Rolled edge, Circular, Unnamed; Polar bear & "1968". Wallet Kit available at the Tandy Leather craft area. Badge. 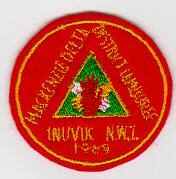 (unlisted) Swiss embroidered on felt, Cut edge, Circular 55mm dia; "MACKENZIE DELTA DISTRICT JAMBOREE INUVIK N.W.T. 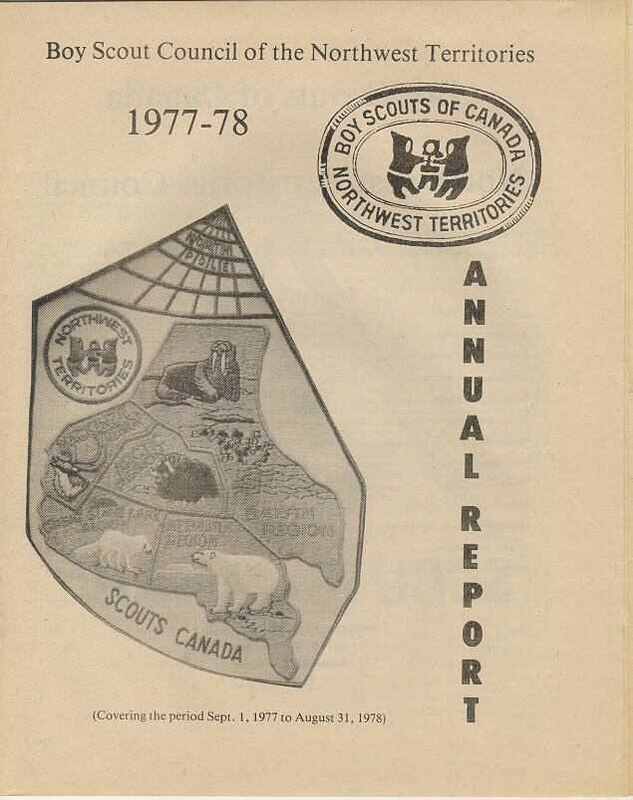 1969"
Northwest Territories Centennial Scout Badge. Version Misc 2a. 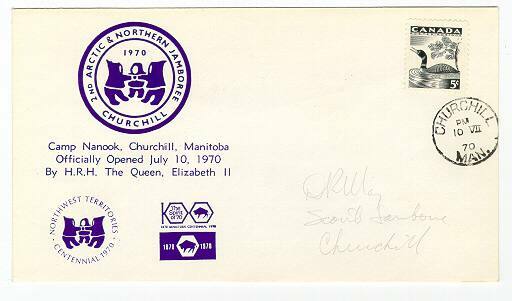 Swiss, Rolled edge, Circular; "NORTHWEST TERRITORIES CENTENNIAL 1970". The theme of the Centennial celebration was "Unity" and the symbol of three parka clad figures was chosen to represent that unity. The three figures represented the three geographical regions of the NWT; Franklin, Keewatin and Baffin as well as the three representative peoples; Indians, Inuit and "other". A special Scouting badge was issued in commemoration of the Centennial and was worn on the uniform during the year. Esssentially identical to the official NWT Centennial badge, which was white with blue lettering, the Scouting badge included the Scout fleur de lis and was green with yellow lettering. 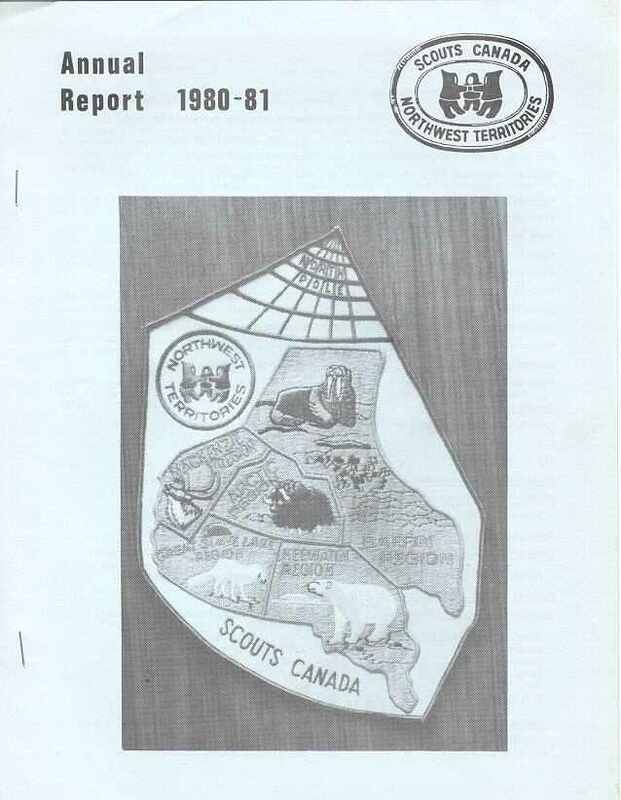 This was the first time the current Scouting symbol for the NWT, the Unity symbol, was used on a Scout badge. Archery Champion, gold border. 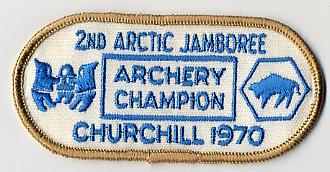 (unlisted) Swiss, Rolled edge, Oblong 110mm x 50mm; "ARCHERY CHAMPION 2ND ARCTIC JAMBOREE CHURCHILL 1970"
Archery Champion, silver border. (unlisted) as above. 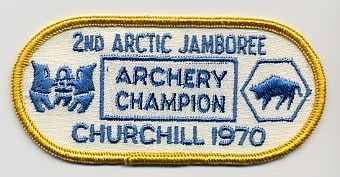 Archery Champion, bronze border. (unlisted) as above. Athletics Champion, gold border. 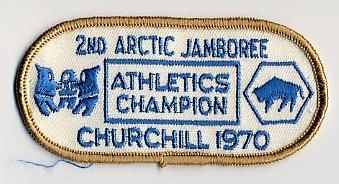 (unlisted) Swiss, Rolled edge, Oblong 110mm x 50mm; "ATHLETICS CHAMPION 2ND ARCTIC JAMBOREE CHURCHILL 1970"
Athletics Champion, silver border. (unlisted) as above. Athletics Champion, bronze border. (unlisted) as above. BC Contingent. (unlisted) Swiss, Cut edge, Irregular 75mm x 100mm; "B.C. 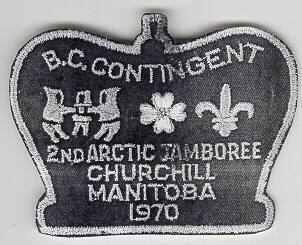 CONTINGENT 2ND ARCTIC JAMBOREE CHURCHILL MANITOBA 1970"
"CAMP NANUK CHURCHILL DISTRICT (MAN)"
To the best of my knowlege, Camp Nanuk was not an official Scout Camp. I assume that these badges were produced specifically for the event. Centennial Award. 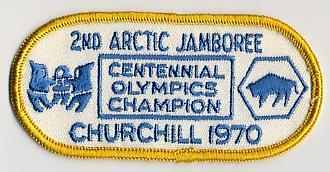 (unlisted) Swiss, Rolled edge, Oblong 110mm x 50mm; "CENTENNIAL AWARD 2ND ARCTIC JAMBOREE CHURCHILL 1970"
Centennial Olympics Champion, gold border. 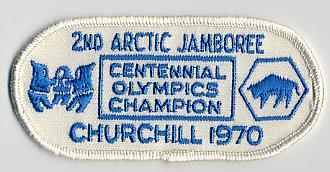 (unlisted) Swiss, Rolled edge, Oblong 110mm x 50mm; "CENTENNIAL OLYMPICS CHAMPION 2ND ARCTIC JAMBOREE CHURCHILL 1970"
Centennial Olympics Champion, silver border. (unlisted) as above. Centennial Olympics Champion, bronze border. (unlisted) as above. Champion Marksman, gold border. 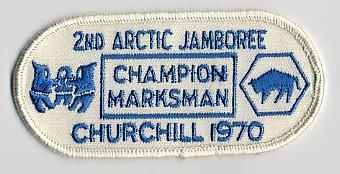 (unlisted) Swiss, Rolled edge, Oblong 110mm x 50mm; "CHAMPION MARKSMAN 2ND ARCTIC JAMBOREE CHURCHILL 1970"
Champion Marksman, silver border. (unlisted) as above. Champion Marksman, bronze border. (unlisted) as above. Handicrafts Champion, gold border. 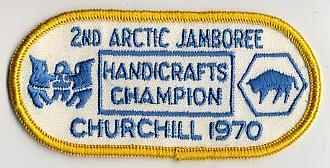 (unlisted) Swiss, Rolled edge, Oblong 110mm x 50mm; "HANDICRAFTS CHAMPION 2ND ARCTIC JAMBOREE CHURCHILL 1970"
Handicrafts Champion, silver border. (unlisted) as above. Handicrafts Champion, bronze border. (unlisted) as above. Badge. Version MAN Jam 10/1a. 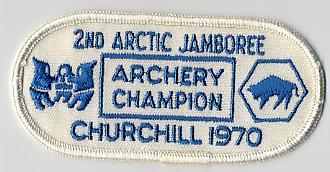 Swiss, Rolled edge, Circular; "2ND ARCTIC & NORTHERN JAMBOREE 1970 CHURCHILL". 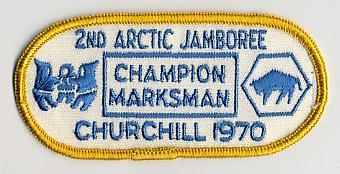 Jamboree Pin. MAN Jam 10a. 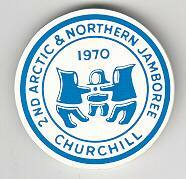 Plastic pin, Circular; "2ND ARCTIC & NORTHERN JAMBOREE 1970 CHURCHILL". 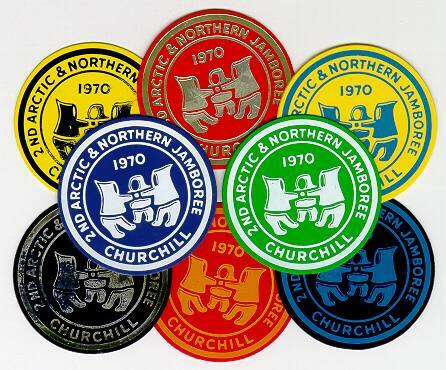 This set of prototype colour discs was supplied by the manufacturer, Thomas Hot Stamping of Waterloo, Ontario for final colour selection of the Jamboree Pin. Staff Badge. 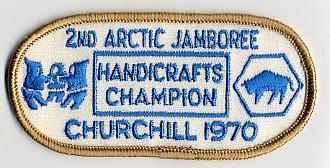 (unlisted) Swiss, Rolled edge, Oblong 110mm x 50mm; "STAFF 2ND ARCTIC JAMBOREE CHURCHILL 1970"
T-shirt. 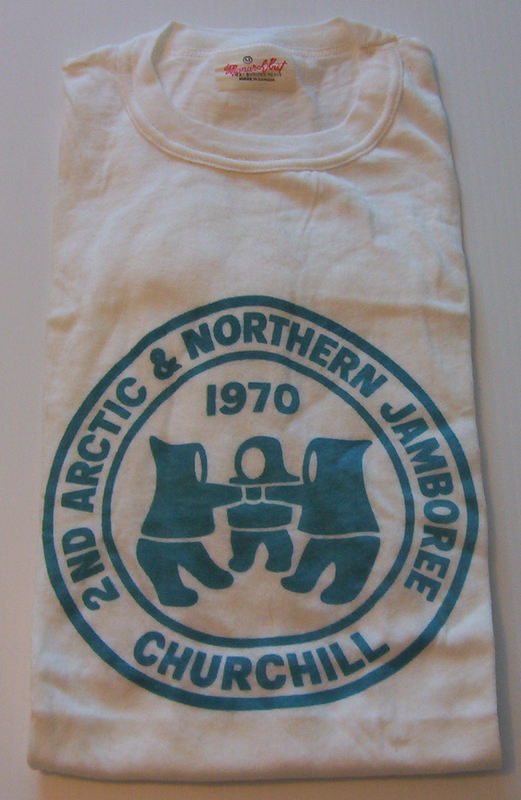 Each Jamboree participant was issued a t-shirt as part of their official uniform for the event. 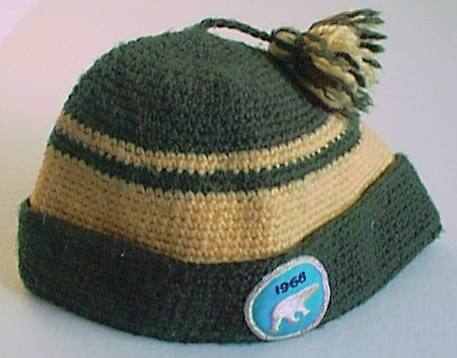 Touque with touque badge MAN Jam 10/2a. 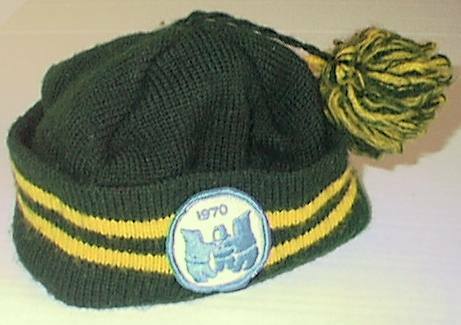 Each Jamboree participant was issued a touque as part of their official uniform for the event. 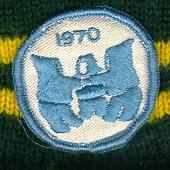 Touque Badge. Version MAN Jam 10/2a. Swiss, Rolled edge, Circular, Unnamed; Three Parka clad figures & "1970" in blue on white background. 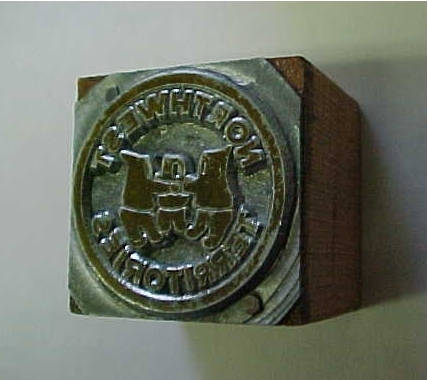 Metal Stamp for leatherwork manufactured by Tandy Leather. 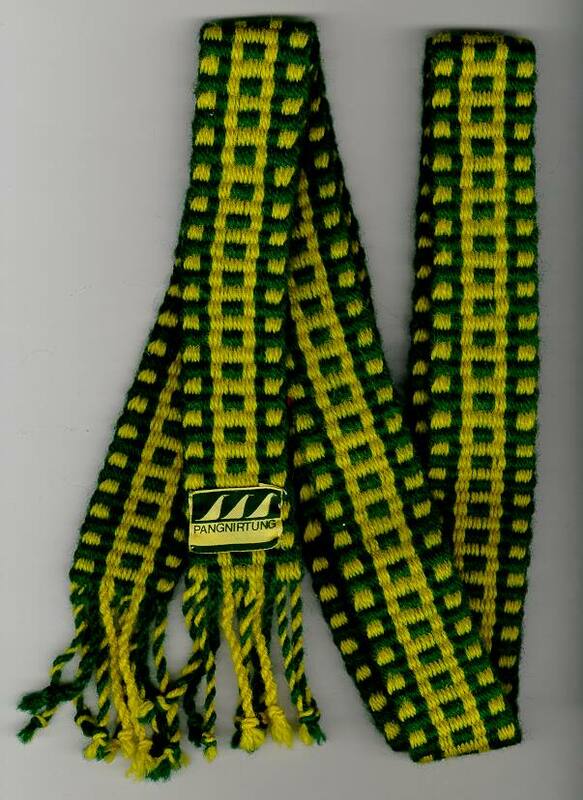 Wind Sash - These sashes were produced by the world reknown Inuit weavers of Pangnirtung especially for Northern Scouts and Scouters. 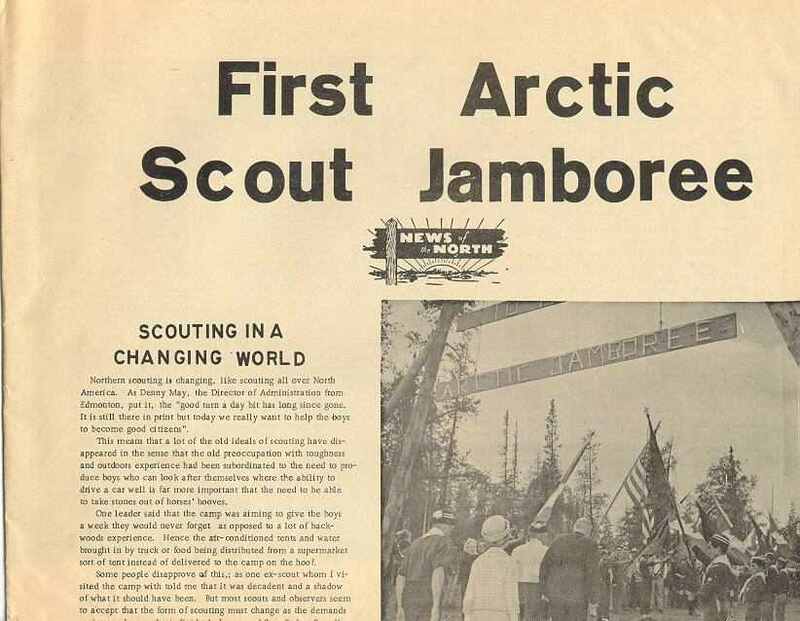 Green and yellow wind sashes were presented to Scouts at the 2nd Arctic and Northern Jamboree. 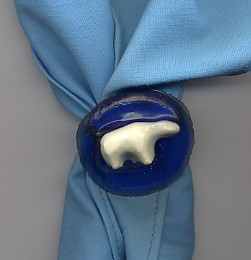 The sash was officially designated to be part of the NWT Scout uniform and was designed to be an easily identifiable symbol for Northern Scouts when they were dressed in winter clothing. 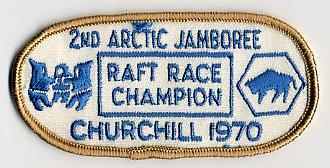 It was to be worn as a belt when in uniform and around the waist on the outside of a parka during outdoor winter activities. 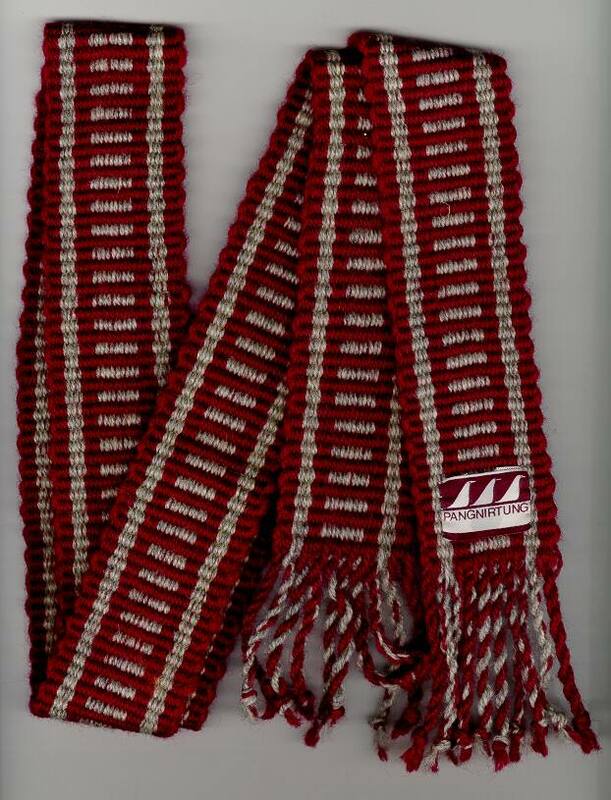 Wind Sash - A small number of maroon and grey wind sashes were presented during the Jamboree. 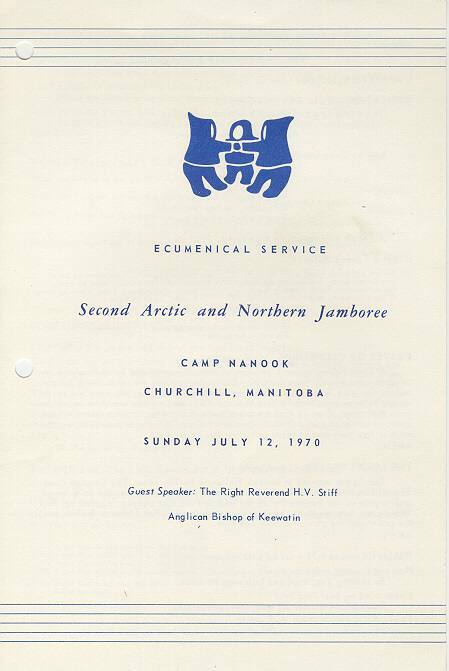 Special presentations were made to 8 Scouters who had given exceptional service to the North on July 9, 1972. The following day four Scouts Aide de Camp to the Royal party also received wind sashes. 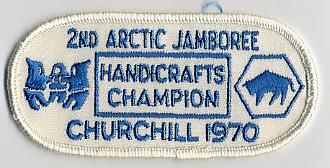 Jamassie Mike, an ivory carver form Pangnirtung had carved special buckles for the sashes. 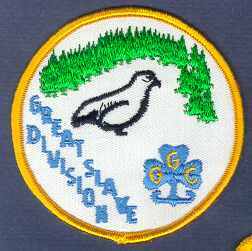 The Scouter sashes had an ivory Scout symbol on each end, and the Aide de Camps had a Scout Symbol at one end and a bird in flight at the other. Raft Race Champion, gold border. 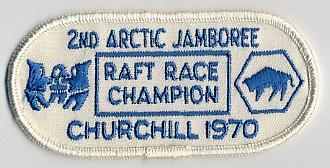 (unlisted) Swiss, Rolled edge, Oblong 110mm x 50mm; "RAFT RACE CHAMPION 2ND ARCTIC JAMBOREE CHURCHILL 1970"
Raft Race Champion, silver border. (unlisted) as above. Raft Race Champion, bronze border. (unlisted) as above. Raft Race Champion, blue border. (unlisted) as above. This version was a manufacturer's sample and only 1 copy exists. Talent Show Champion, gold border. 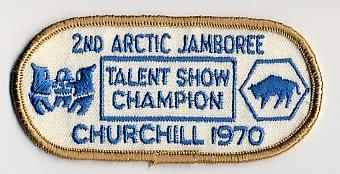 (unlisted) Swiss, Rolled edge, Oblong 110mm x 50mm; "TALENT SHOW CHAMPION 2ND ARCTIC JAMBOREE CHURCHILL 1970"
Talent Show Champion, silver border. (unlisted) as above. Talent Show Champion, bronze border. (unlisted) as above. Waterfront Champion, gold border. 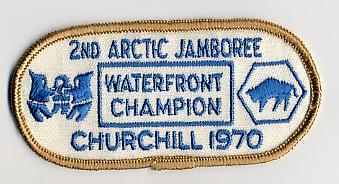 (unlisted) Swiss, Rolled edge, Oblong 110mm x 50mm; "WATERFRONT CHAMPION 2ND ARCTIC JAMBOREE CHURCHILL 1970"
Waterfront Champion, silver border. (unlisted) as above. Waterfront Champion, bronze border. (unlisted) as above. 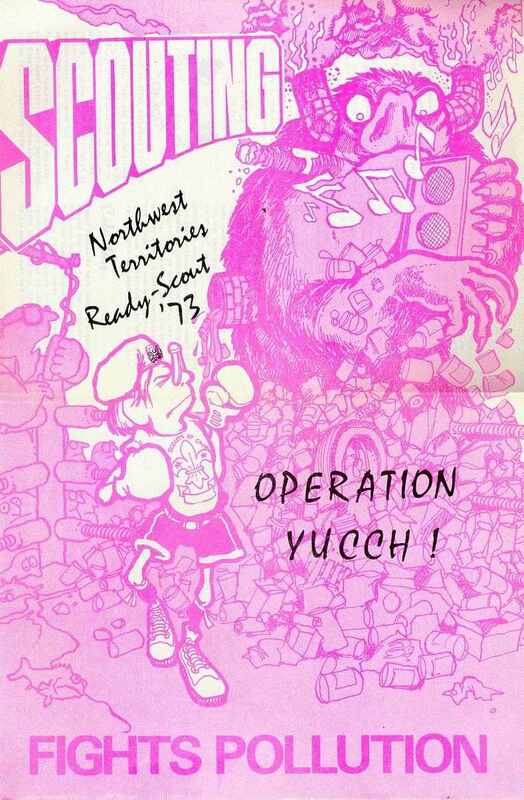 Operation Yucch. (unlisted) Swiss, Rolled edge, Irregular; "N.W.T. 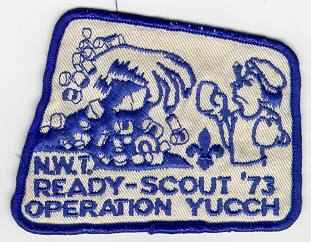 READY-SCOUT '73 OPERATION YUCCH"
BC Contingent. 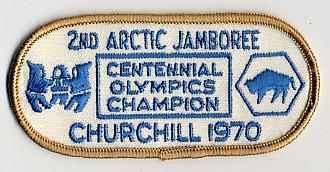 (unlisted) Printed cloth 160mm x 160mm; "1ST NWT JAMBOREE BC CONTINGENT"
Badge. Version Jam 1a. 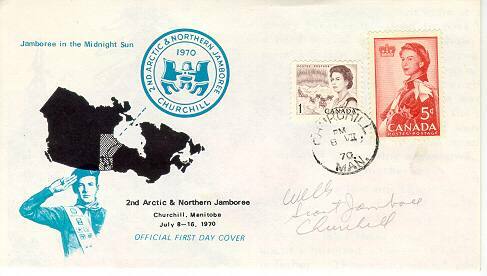 Swiss, Rolled edge, Circular; "1ST NORTHWEST TERRITORIES JAMBOREE 1973 FORT SMITH". Envelope: Type A. (Official Cover, 1st Day of Issue Cancellation) The official first day covers were produced by George Wells. Gilwell Reunion. 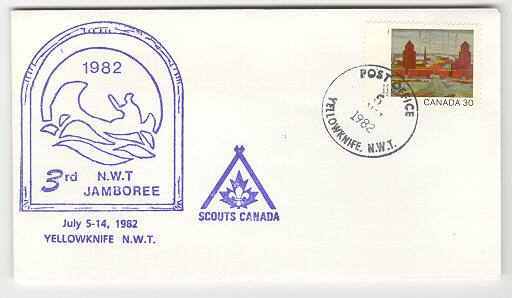 (unlisted) Swiss, Rolled edge, Oval 100mm x 130mm; "1ST NORTHWEST TERRITORIES Jamboree GILWELL REUNION FORT SMITH 1973". 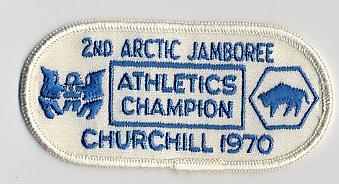 3000 yards of parka trim was produced to make into the Jamboree Headbands. Out of 249 pins manufactured, half were produced with a clasp-back, half with a screw-back. An unknown number were made into earrings. An unknown number of pin blanks were made into thank-you gifts and glued onto angle cut pieces of drill core. (Presented to the Town of Fort Smith). 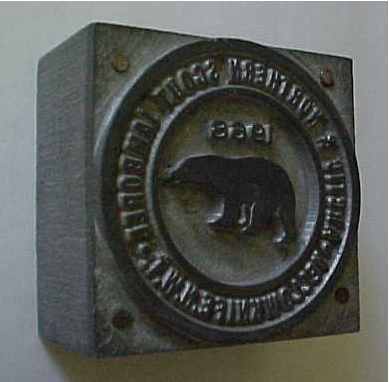 Recent communications with Fort Smith Town Hall and Northern Lights Museum have indicated that no one currently knows the whereabouts of this item. Thank You Gift. 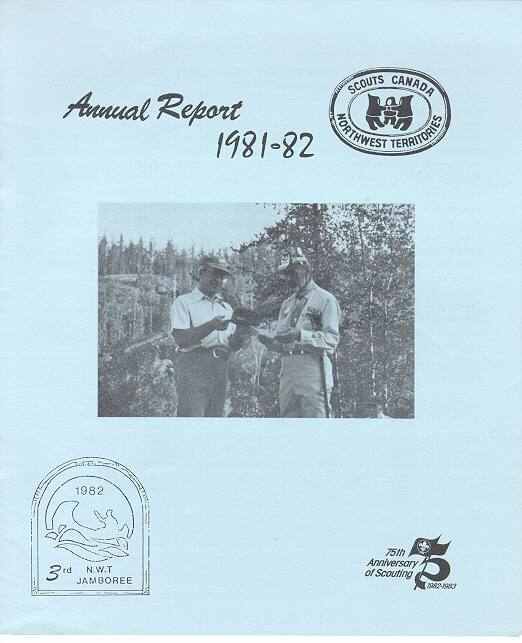 Pieces of the Canadian Shield were collected by Yellowknife Venturers under Ken Goldstone and the Jamboree plate was attached by Rev. John Sperry. 75 were given out as Thank You gifts to staff and jamboree helpers. Thank You Gift, small unattached plate. 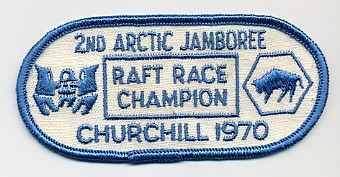 The Jamboree Challenge Bear Claw was given to participants who earned at least ten of the beads. Woodbadge. 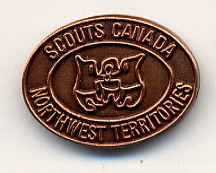 (unlisted) Swiss, Rolled edge, Oval 100mm x 130mm; "1ST NORTHWEST TERRITORIES Jamboree WOOD BADGE FORT SMITH 1973". 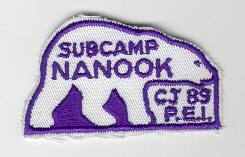 Sub-Camp Nanook. 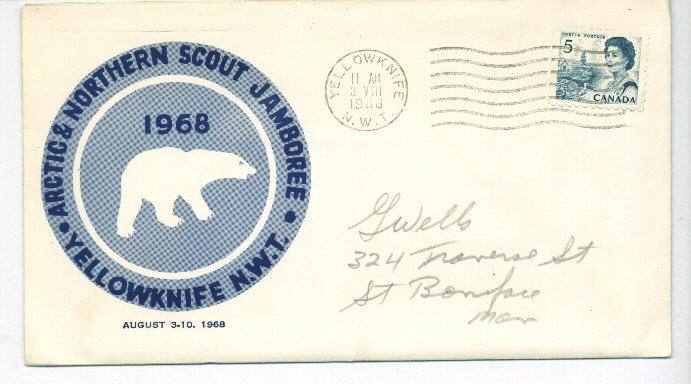 (unlisted) Swiss, Rolled edge, Half circle; "SUB-CAMP NANOOK CJ77 PEI". Mesh backing is the same as Challenge and Staff badges. Sub-Camp Chiefs Challenge. (unlisted) Swiss, Rolled edge, Half circle; "SUB-CAMP CHIEFS CHALLENGE". 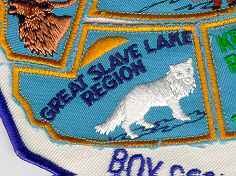 Mesh backing is the same as Nanook and Staff badges. Sub-Camp Staff. (unlisted) Swiss, Rolled edge, Half circle; "STAFF". 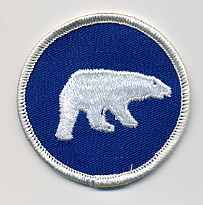 Mesh backing is the same as Nanook and Challenge badges. 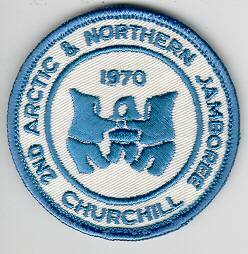 This Staff badge was used for all subsequent Sub-Camps Nanook, CJ and WJ. Badge. Version Jam2a. Swiss, Rolled edge, Square; "2ND N.W.T. 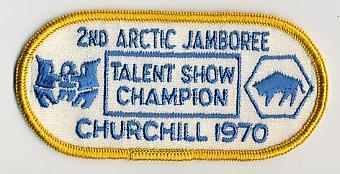 JAMBOREE 1978". 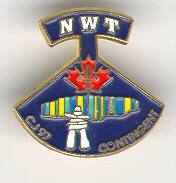 NWT Contingent. 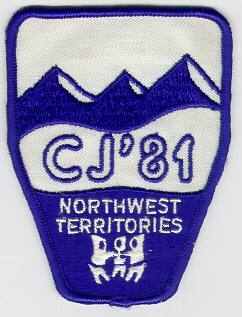 (unlisted) Swiss, Rolled edge, Irregular: "CJ'81 NORTHWEST TERRITORIES". Sub-Camp Nanook. 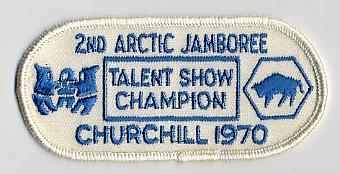 (unlisted) Swiss, Rolled edge, Half Circle; "SUB-CAMP NANOOK CJ'81 ALBERTA". Sub-Camp Chiefs Challenge. (unlisted) Swiss, Rolled edge, Half circle; "SUB-CAMP CHIEFS CHALLENGE". 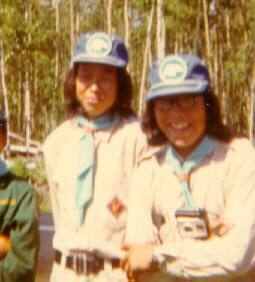 At the 1981 Canadian Scout Jamboree held at Kananaskis Country, Alberta Sub-Camp Nanook (Polar Bear) issued a challenge to Scouts in the Sub Camp - I cant remember all the details but they had to find a NWT Scout, learn how to pronounce Katamivik correctly (its NOT "Ka Teem A Vik" - its "Ka Ta Mavik"), and other challenges. 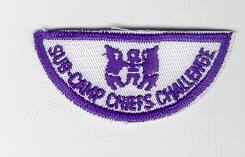 Each Scout & Scouter in the Sub-Camp got the top half of the badge when they arrived and the bottom half when they met the Sub-Camp Chiefs Challenge. 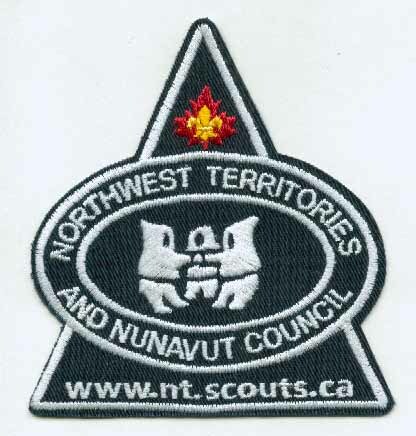 The top half of the badge has Nanook, and the bottom half the NWT Unity Symbol which belongs to the NWT Scout Council. Badge. Version Jam 3a. Swiss, Rolled edge, Irregular; "3RD N.W.T. 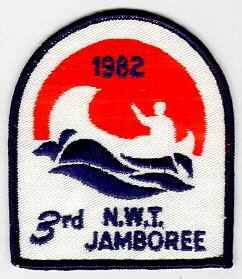 JAMBOREE 1982". 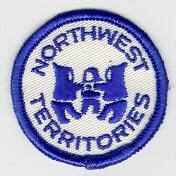 Northwest Territories Contingent. 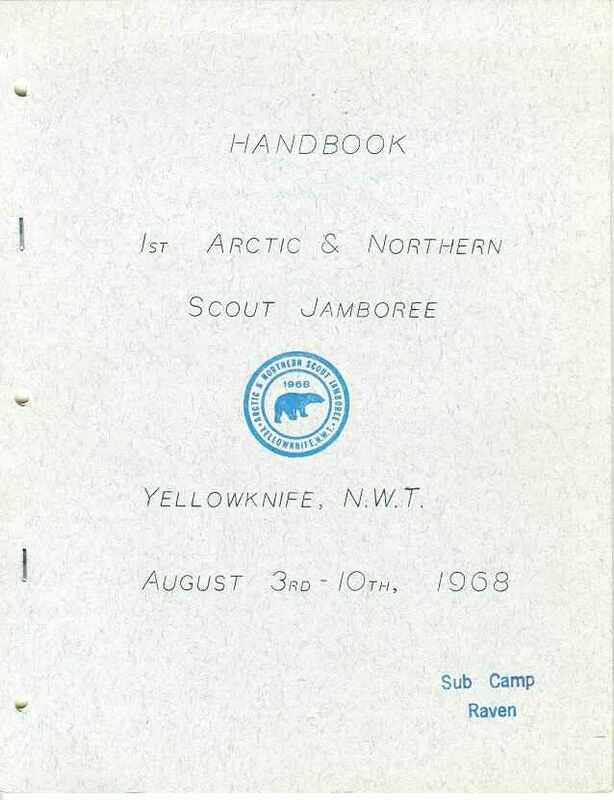 Swiss, Rolled edge, Irregular; "NORTHWEST TERRITORIES SCOUTS CANADA 15TH WORLD JAMBOREE". 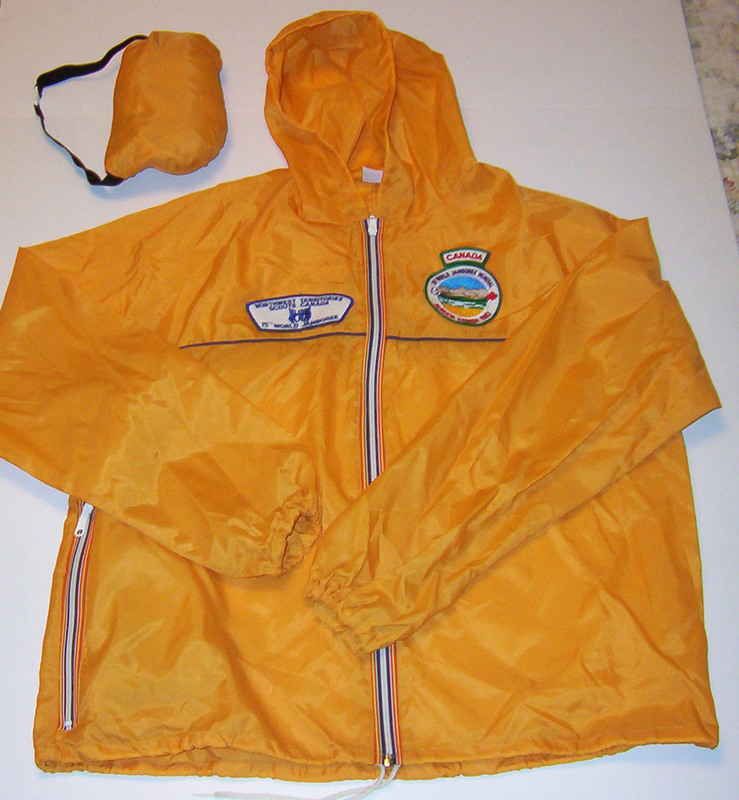 Light weight rain / wind jacket designed to roll up into self-contained pouch (right pocket). 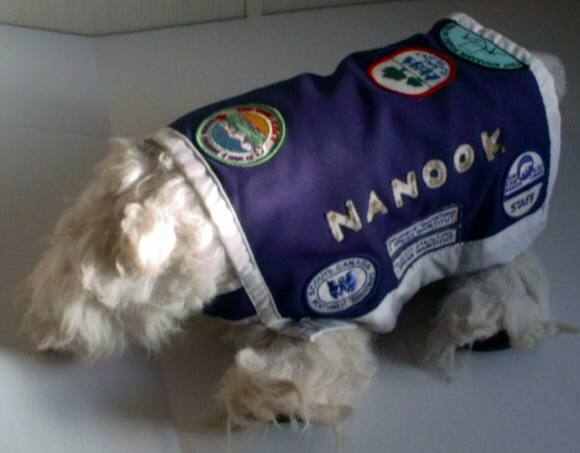 Sub-Camp Nanook. 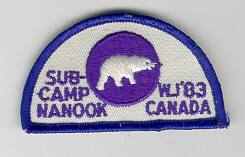 (unlisted) Swiss, Rolled edge, Half circle; "SUB-CAMP NANOOK WJ '83 CANADA". Gause backing is the same as Challenge badge. 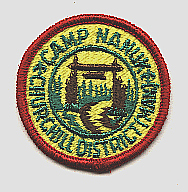 Sub-Camp Nanook Jacket badge. 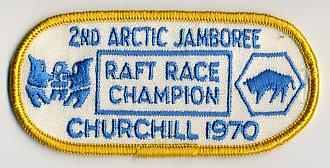 (unlisted) Swiss Rolled Edge, Circular 75mm dia; "XV WORLD JAMBOREE MONDIAL ALBERTA CANADA 1983". 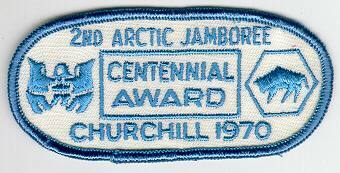 Same basic design as Jamboree badge but smaller. Sub-Camp Chiefs Challenge. (unlisted) Swiss, Rolled edge, Half circle; "SUB-CAMP CHIEFS CHALLENGE". 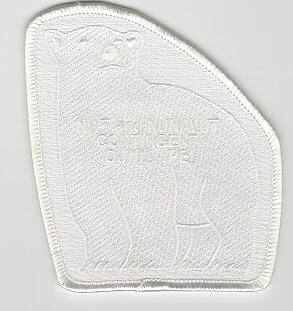 Gauze backing is the same as Sub-Camp Nanook badge. Sub-Camp Nanook Language Strips. (unlisted) Swiss, Rolled edge, Rectangular. 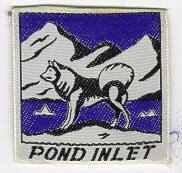 Sub-Camp Nanook Emblem. (unlisted) Swiss, Rolled edge, Circular; unnamed. Fund-raiser for the Scout Brotherhood Fund. 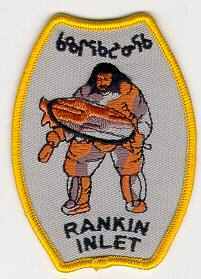 Sub-Camp Nanook Shoulder Flash. 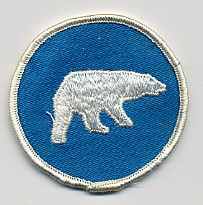 (unlisted) Swiss, Rolled edge, Irregular; "SUB CAMP POLAR BEAR WJ'83 FRIDO PROFOEHR". 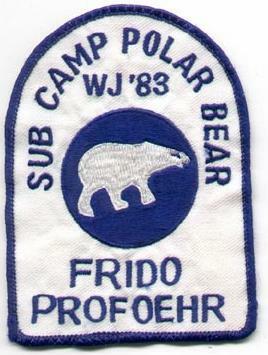 Frido Profoehr was an Iqaluit Scouter. 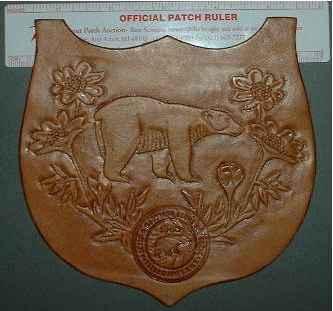 Crest of P. Olar Bear "from the South side"
Fort Simpson NWT Contingent. (unlisted) Swiss, Rolled edge, Circular 75mm dia; "FORT SIMPSON N.W.T. 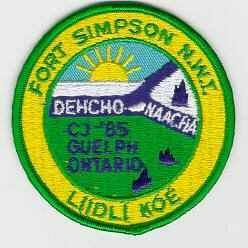 LIIDLI KOE DEHCHO NAACHA CJ '85 GUELPH ONTARIO". NWT Contingent. 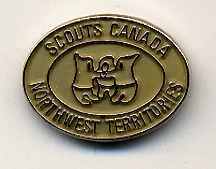 (unlisted) Swiss, Rolled edge, Irregular; "NORTHWEST TERRITORIES SCOUTS CANADA CJ '85". 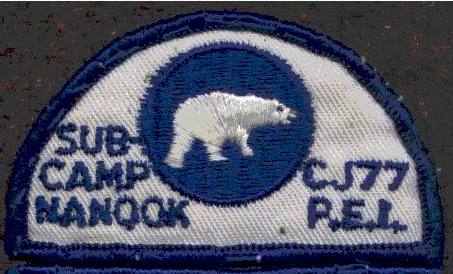 Sub-Camp Nanook. (unlisted) Swiss. 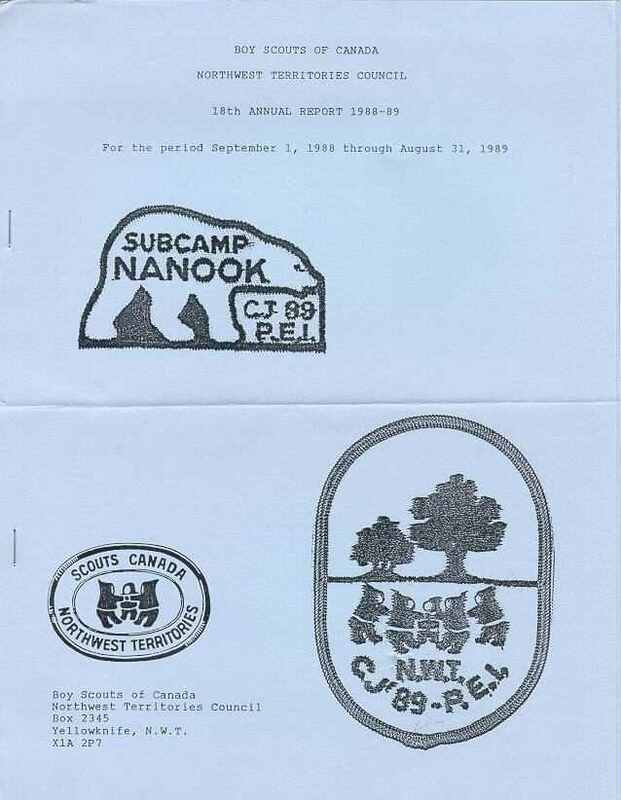 Cut edge, Irregular; "SUBCAMP NANOOK CJ 85 GUELPH". There was no matching Sub-camp Chiefs Challenge Badge, but the one from CJ '81 appears to have been used. Sub-Camp Nanook Fund-raiser for the Scout Brotherhood Fund. Denny May and two volunteers we operated a NWT display at CJ85 in Guelph, Ontario, for the N.W.T. Scout Council. 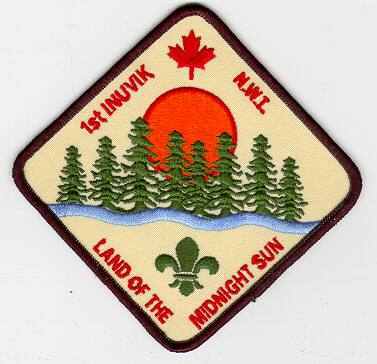 They raised funds for the Canadian Scout Brotherhood Fund by selling the Nanook badge for $1.00 each. 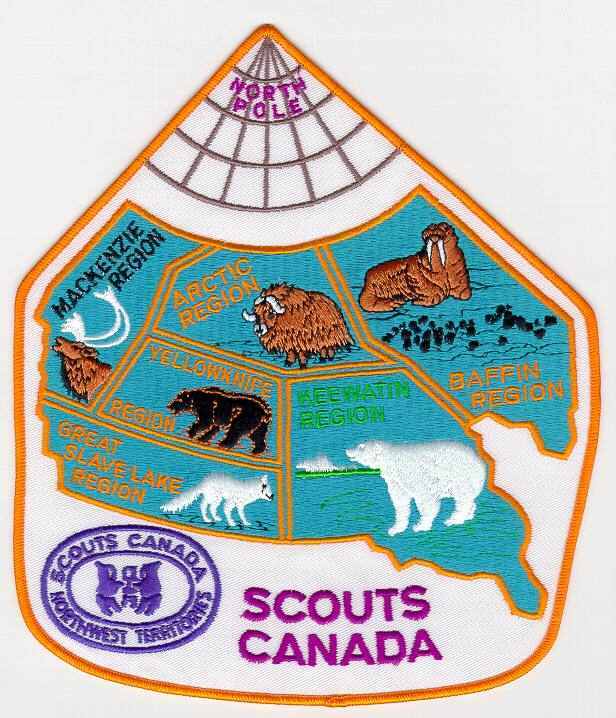 16 piece Canada Map badge. Size: 17 inches X 23.5 inches. One of an unknown limited run, probably < 100. Each Canadian province and territory had its own badge to make up the map of Canada. 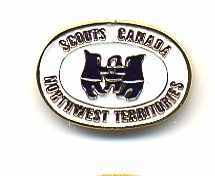 This is the contingent Pin from the Provinces of Alberta & Saskatchewan & the N.W.T., Canada - taken by Scouts to the 1987/88 World Scout Jamboree in Australia. 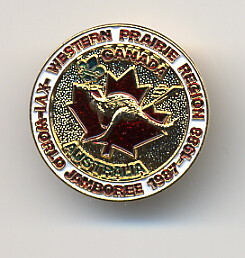 This conglomerate called themselves the Western Prairie Region (there is/was no such region).The pin measures 1" and the design is the Kangaroo over the Canadian Maple Leaf Flag. 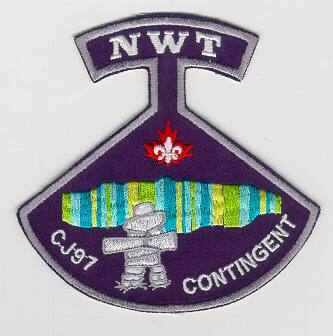 NWT Contingent. (unlisted) Swiss, Rolled edge, Oblong; "N.W.T. CJ '89 - P.E.I." 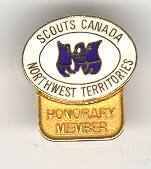 I'm not sure why the badge designer decided to use one of the one of the designs from the NWT Centennial in which two extra figures were added to the normal unity symbol. Sub-Camp Nanook. 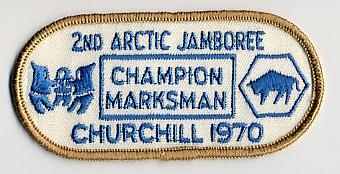 (unlisted) Swiss, Cut edge, Irregular; "SUBCAMP NANOOK CJ 89 P.E.I." 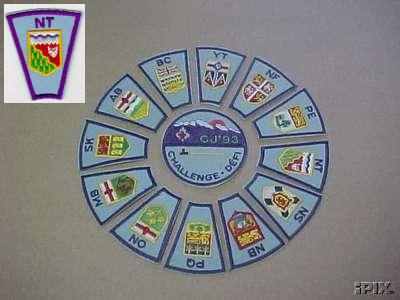 Subcamp Chiefs Challenge. (unlisted) Swiss, Cut edge, Half circle; "SUB-CAMP CHIEFS CHALLENGE". 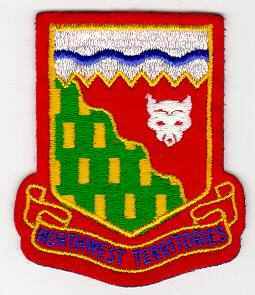 Northwest Territories Contingent. 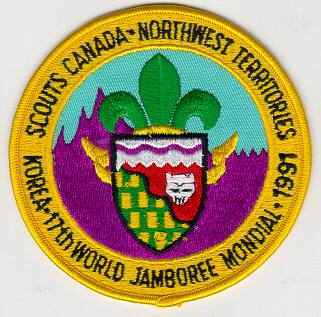 (unlisted) Swiss, Rolled edge, Circular; "SCOUTS CANADA NORTHWEST TERRITORIES KOREA 17th WORLD JAMBOREE MONDIAL 1991". Northwest Territories Contingent. (unlisted) Swiss, Rolled edge, Oblong; "CJ 93 NWT". Badge designed by Dawn Lepard. Challenge Game, NWT Portion. (unlisted) Swiss, Cut edge, Irregular; "NT". 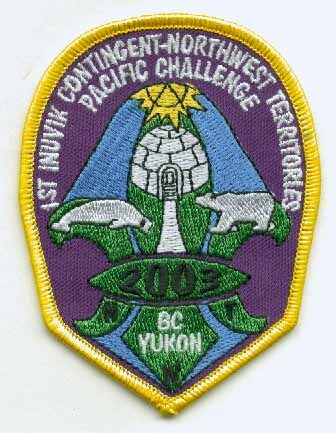 Northwest Territories Contingent. 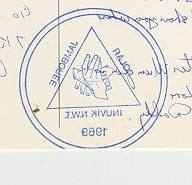 (unlisted) Swiss, Rolled edge, Triangular; "N.W.T. 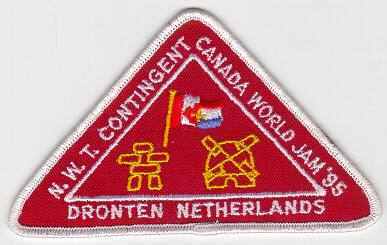 CONTINGENT CANADA WORLD JAM '95 DRONTEN NETHERLANDS". NWT Contingent, red border. (unlisted) Swiss, Cut edge, Irregular; "NWT CJ97 CONTINGENT". 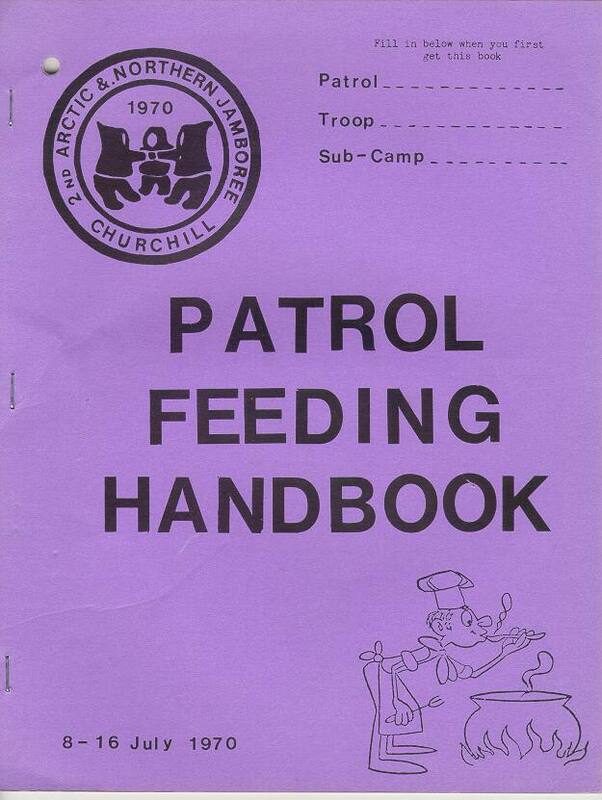 Issued to, and distributed by, the 6th Yellowknife Scouts. NWT Contingent. yellow border. 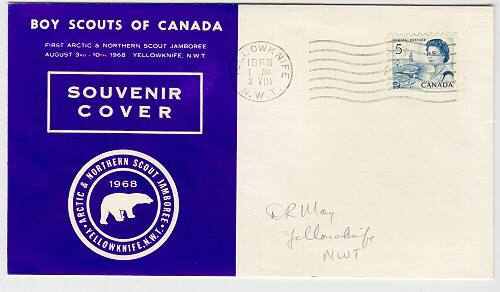 (unlisted) Swiss, Cut edge, Irregular; "NWT CJ97 CONTINGENT"
Issued to, and distributed by, the 7th Yellowknife Scouts. NWT Contingent, green border. (unlisted) Swiss, Cut edge, Irregular; "NWT CJ97 CONTINGENT". 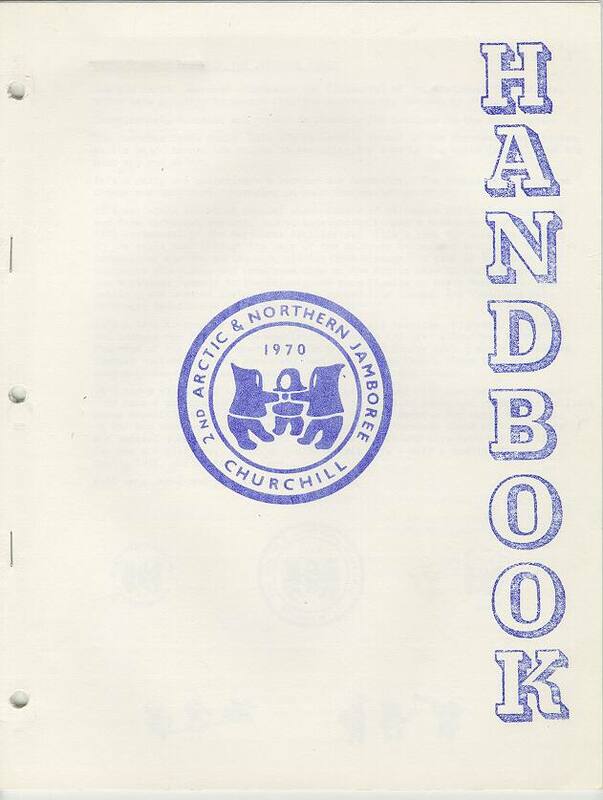 Issued to, and distributed by, the Inuvik Scouts. 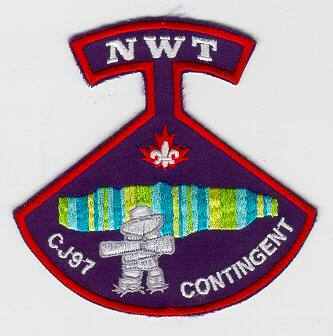 NWT Contingent, blue border. (unlisted) Swiss, Cut edge, Irregular; "NWT CJ97 CONTINGENT". 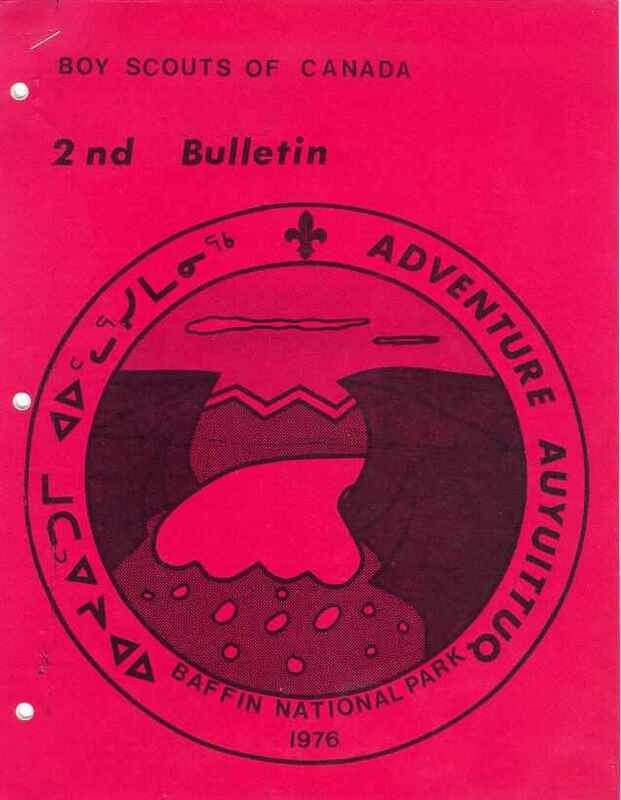 Issued to, and distributed by, the 5th Yellowknife Scouts and Venturers. NWT Contingent, silver border. (unlisted) Swiss, Cut edge, Irregular; "NWT CJ97 CONTINGENT". 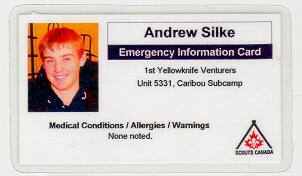 Issued to, and distributed by, the 9th Yellowknife Leader on Offer of Service. Subcamp Mackenzie Alberta and NWT. (unlisted) Swiss, Rolled edge, Circular; "ALBERTA CJ '97 N.W.T. 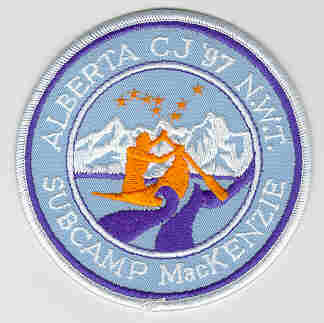 SUBCAMP MacKENZIE". 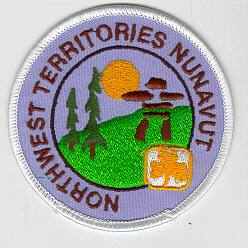 1st NWT and Nunavut Cuboree. 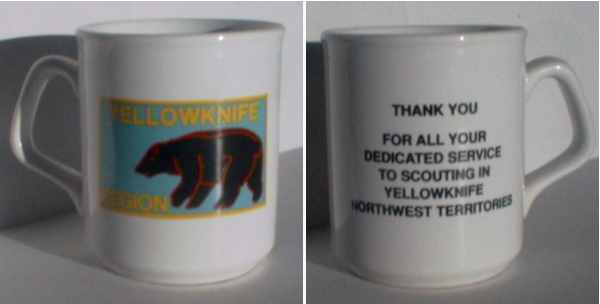 (unlisted) Swiss, Rolled edge, Square; "MOWGLI'S MIDNIGHT HOWL 1ST NWT & NUNAVUT CUBOREE YELLOWKNIFE, NWT JUNE 2001". 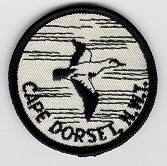 Badge designed by Alf Silke. 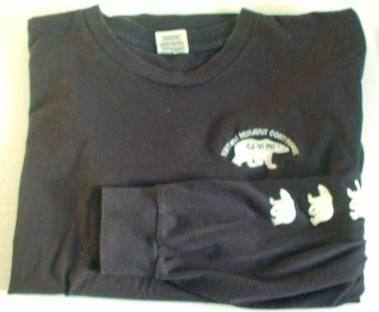 cuboree uniform for the weekend. official cuboree uniform for the weekend. 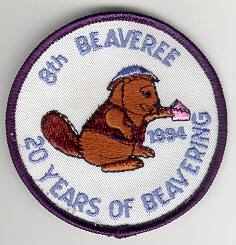 Beaver Subcamp. 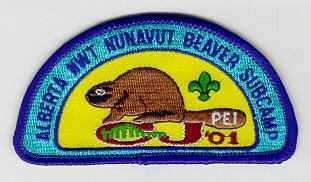 Swiss, Rolled edge, Irregular; "ALBERTA NWT NUNAVUT BEAVER SUBCAMP PEI CJ'01". Beaver Subcamp, Inuit and Dene Games Give-away. 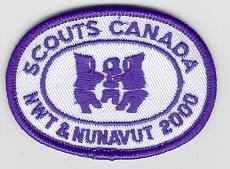 (unlisted) Swiss, Rolled edge, Oval; SCOUTS CANADA NWT & NUNAVUT 2001". 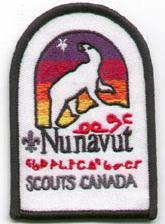 Authorized use of the design was given by the NWT and Nunavut Scout Council. The activity was either cut short or cancelled outright due to a severe weather warning and thus the badge distribution may have also suffered. 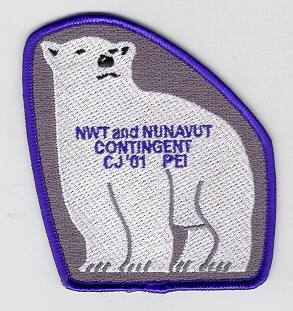 people who were looking for the "Nunavut Contingency badge". NWT and Nunavut Contingent, red border. (unlisted) Swiss, Rolled edge, Irregular; "NWT and NUNAVUT CONTINGENT CJ'01 PEI". Print run: 375 badges with this colour border. NWT and Nunavut Contingent, yellow border. 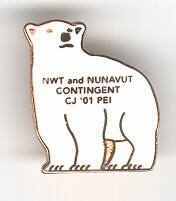 (unlisted) Swiss, Rolled edge, Irregular; "NWT and NUNAVUT CONTINGENT CJ'01 PEI". NWT and Nunavut Contingent, green border. 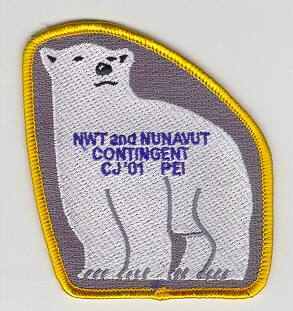 (unlisted) Swiss, Rolled edge, Irregular; "NWT and NUNAVUT CONTINGENT CJ'01 PEI". NWT and Nunavut Contingent, blue border. 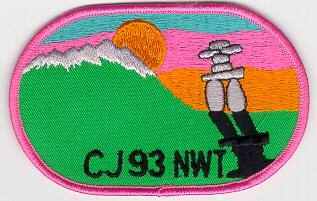 (unlisted) Swiss, Rolled edge, Irregular; "NWT and NUNAVUT CONTINGENT CJ'01 PEI". 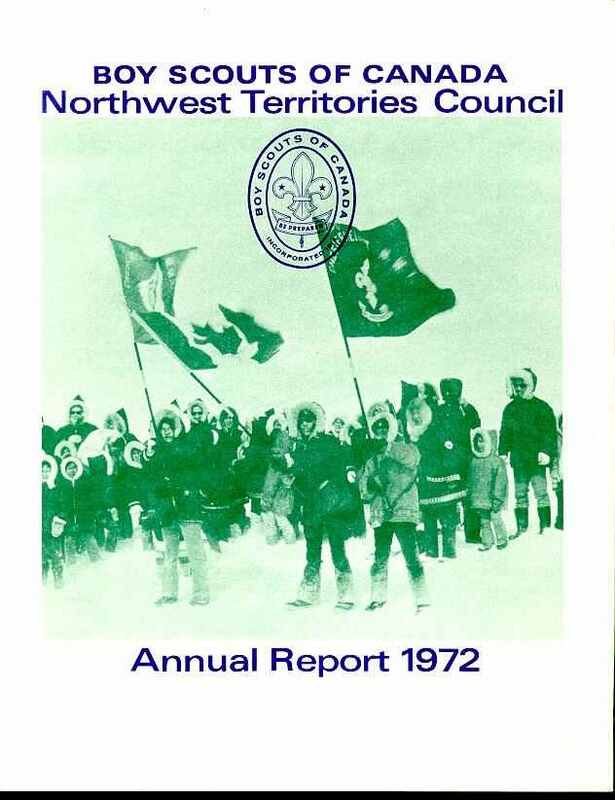 NWT and Nunavut Contingent, Territorial Blizzard. 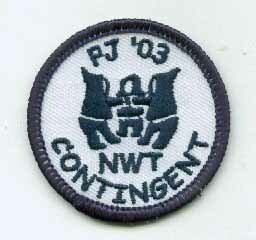 (unlisted) Swiss, Rolled edge, Irregular; "NWT and NUNAVUT CONTINGENT CJ'01 PEI". 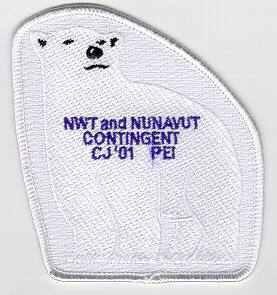 NWT and Nunavut Contingent, Error Bear. (unlisted) Swiss, Rolled edge, Irregular; "NWT and NUNAVUT CONTINGENT CJ'01 PEI". 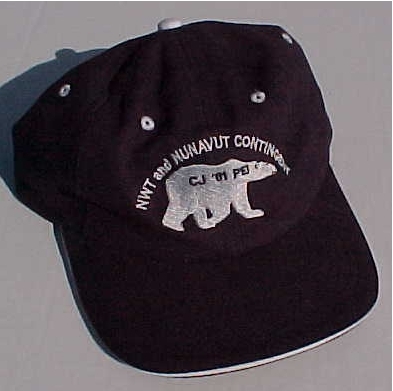 NWT and Nunavut Contingent Cap. Northwest Territories. NWT1a. Ribbon, Rectangular; "N W T", Various shades of ribbon. Northwest Territories. Version NWT 1b. Swiss, Cut edge, Shield 45mm x 73mm, Unnamed; Two narwhal, Compass point, Wavy line, Gold billets & fox's head, Tourist badge but worn by scouting. Northwest Territories. Version NWT 1c. Swiss, Cut edge, Shield 37mm x 45mm, Unnamed; Wavy line, Gold billets & fox's head, Tourist badge but worn by scouting. Northwest Territories. Version NWT 1c-2. 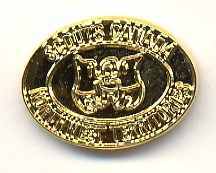 Swiss, Cut edge, Shield 37mm x 45mm, Unnamed; Wavy line, Gold billets & fox's head, Tourist badge but worn by scouting. This appears to be a variant issue rather than an excised center portion of NWT 1x. Northwest Territories. Version NWT 1d. 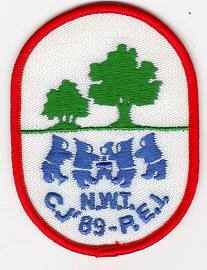 Swiss, Cut edge, Shield 60mm x 45 mm; "N.W.T." Northwest Territories. Version NWT 1x. (unlisted) Swiss, Cut edge, Shield 65mm x 50 mm; "NORTHWEST TERRITORIES". 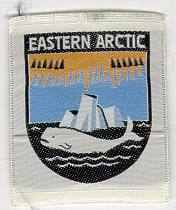 Appears to have been worn predominantly in the Eastern Arctic (now Nunavut). The inside shield is the same size as NWT 1c, but with slight differences in design and colours. Northwest Territories. Version NWT 1xx. 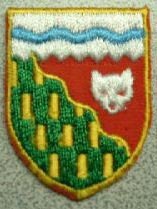 ( unlisted) Swiss embroidered on felt, Cut edge, Irregular 92mm x 80 mm; "NORTHWEST TERRITORIES". Northwest Territories. Version NWT 1e. Swiss, Rolled edge, Circular; "NORTHWEST TERRITORIES". Northwest Territories. Version NWT 1e/1. (unlisted) Swiss, Cut edge, Curved double strip 100mm across; "NORTHWEST TERITORIES SCOUT COUNCIL". Contemporary to, and worn with NWT 1e and NWT 1e/2 by the Council Service Team. 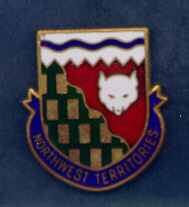 Northwest Territories badge. Version NWT 1e/2. (unlisted) Swiss, Cut edge, Curved double strip 100mm across; "SERVICE SCOUTER". Contemporary to, and worn with NWT 1e and NWT 1e/1 by the Council Service Team. 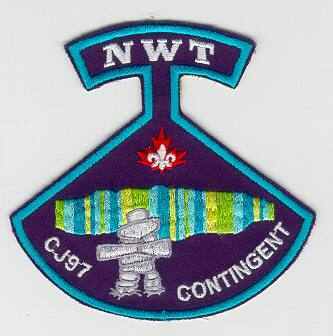 Northwest Territories Badge. Version 1f. 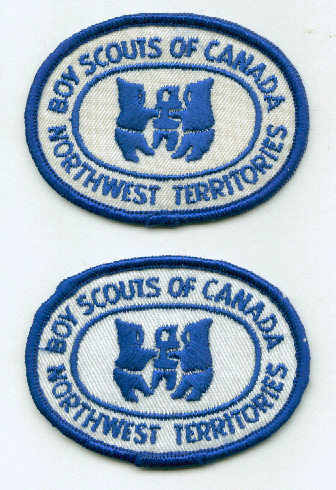 Swiss, Rolled edge, Oval; "BOY SCOUTS OF CANADA NORTHWEST TERRITORIES". 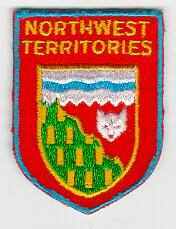 Northwest Territories Badge.Version NWT 1f/1. 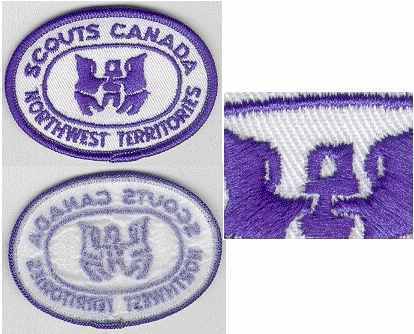 (unlisted) Swiss, Cut edge, Curved double strip 100mm across; "BOY SCOUTS OF CANADA NORTHWEST TERRITORIES". Contemporary to, and worn with NWT 1f by the Council Service Team. Northwest Territories. Version 1g. 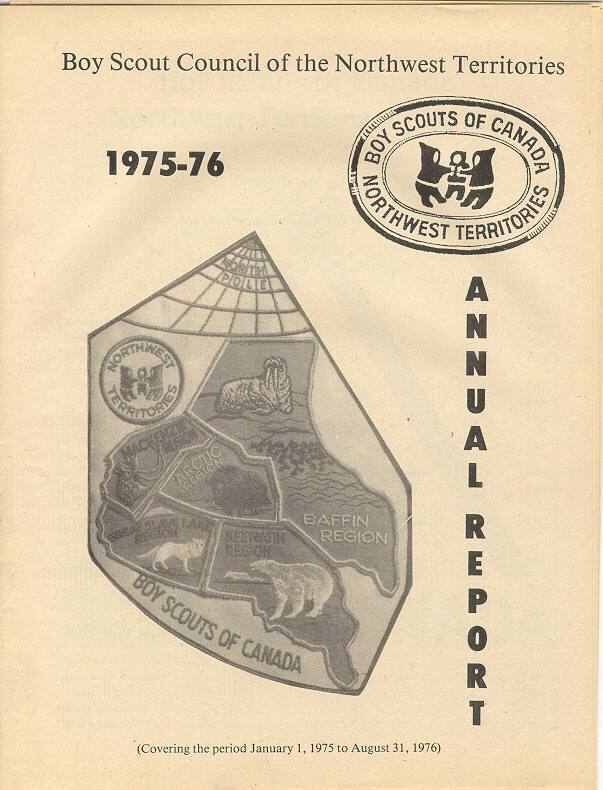 Swiss, Rolled edge, Oval; "SCOUTS CANADA NORTHWEST TERRITORIES"
but B&S continued to supply the rolled edge version. Northwest Territories. Version NWT 1g/1. 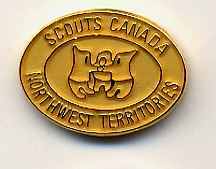 (unlisted) Swiss, Cut edge, Irregular; "NORTHWEST TERRITORIES SCOUTS CANADA ". Contemporary to NWT 1g and 2a. 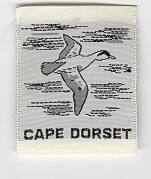 Worn with NWT 1g/2 by the Council Service Team. Northwest Territories. Version NWT 1g/2. (unlisted) Swiss, Cut edge, Strip 75mm across; "SERVICE SCOUTER". Worn with NWT 1g/1 by the Council Service Team. Northwest Territories and Nunavut. Version NWT 2a. 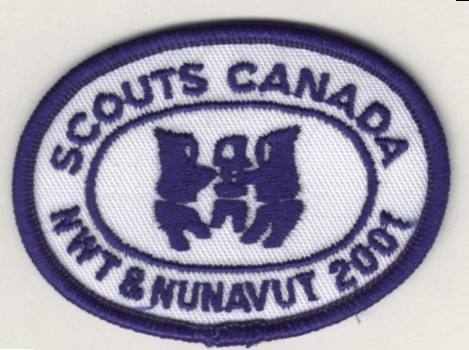 Swiss, Rolled edge, Oval; "SCOUTS CANADA NWT & NUNAVUT 2000"
The NWT and Nunavut Scout Council ceased to exist in April 2004. 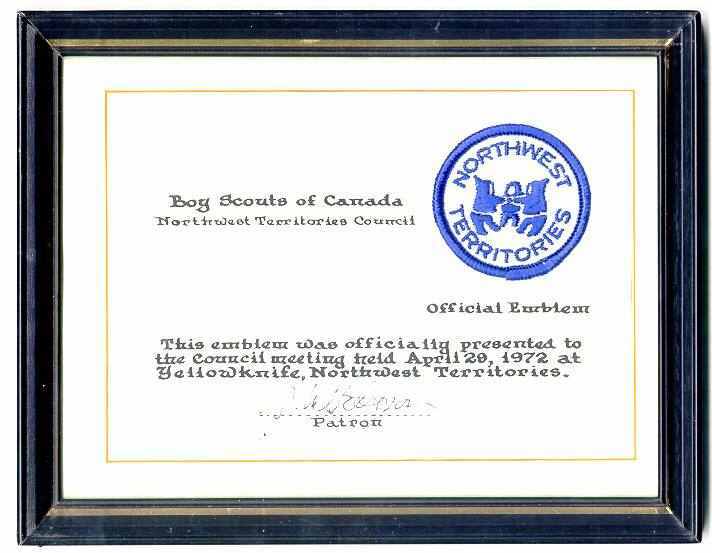 Scouting activities in the Northwest Territories are now overseen by the Northern Lights Region in Alberta. The referred website is currently inactive. 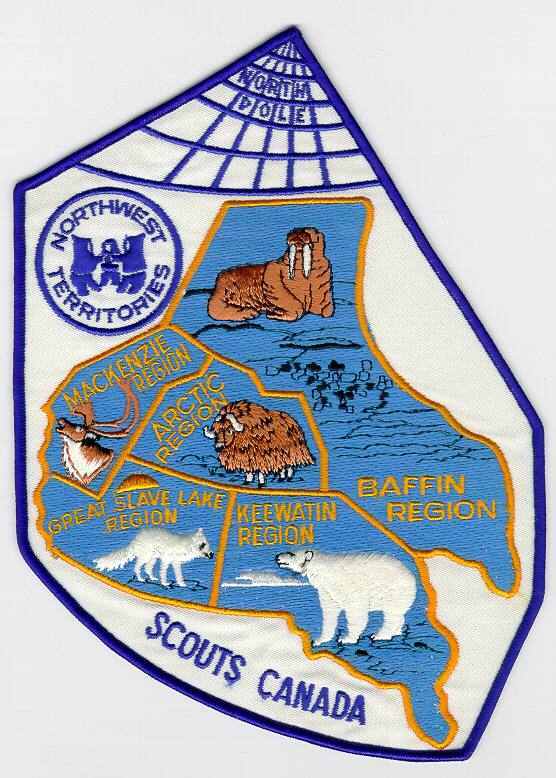 Northern Lights Council: NWT Service Area Badge. Version Alta N11a. 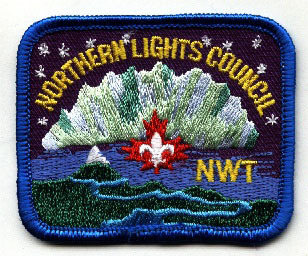 Swiss, Rolled edge, Rectangular; "NORTHERN LIGHTS COUNCIL NWT"
This badge was issued by the Northern Lights Council in 2004 when they were given administration of Scouting activities in the NWT. 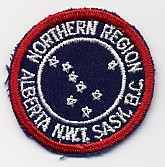 The old "Northern Lights Region" badge was re-issued with the name change to "Council" and badges were issued with either "Alberta" or "NWT" as add-on features. Arctic Region. Version A1a. Swiss, Cut edge, Irregular 70mm x 58mm; Outlined horns & nose, Various shades of yellow lettering & border. Arctic Region. Version A1b. Swiss, Cut edge, Irregular 85mm x 50mm; Horns & nose embroidered in white. 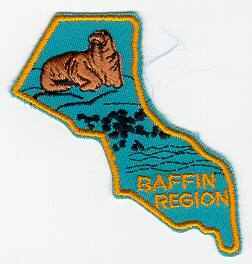 Baffin Region. Version B1a. Swiss, Cut edge, Irregular 80mm x 80mm; Tusks in black, various shades of blue background. 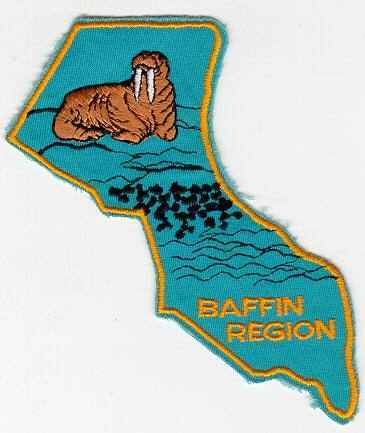 Baffin Region. Versions B1b. Swiss, Cut edge, Irregular 80mm x 100mm; Tusks in white. Baffin Region: Misc 3a. Swiss, Cut edge, Irregular 125mm x 140mm. Cambridge Bay. Version C1b. 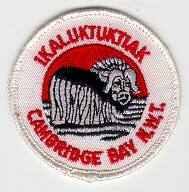 Swiss, Rolled edge, Rectangular; "IKALUKTUKIAK CAMBRIDGE BAY N.W.T.". 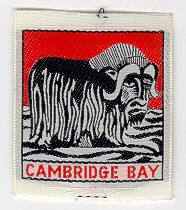 Cambridge Bay. Version C1c. Swiss, Rolled edge, Circular 80mm dia. 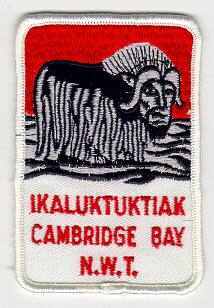 ; "IKALUKTUKIAK CAMBRIDGE BAY N.W.T.". Cambridge Bay. Version C1d. Swiss, Rolled edge, Circular 60mm dia. 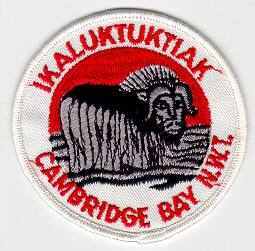 ; "IKALUKTUKIAK CAMBRIDGE BAY N.W.T.". In use from 1987 on. Cape Dorset. Version C2b. 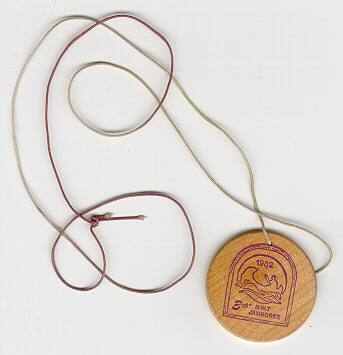 Swiss, Rolled edge, Circular; "CAPE DORSET, N.W.T.". Coppermine. Version C3a. Swiss, Rolled edge, Rectangular; "KUGLUKTUK COPPERMINE N.W.T. ", Various shades of yellow/gold mountain. Coppermine. Version C3x. 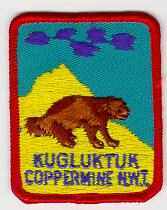 (unlisted) Ribbon, strip; "1ST COPPERMINE"
Eskimo Point. Version E2x. Unlisted. Ribbon, Strip; "ESKIMO POINT". Frobisher Bay. Version F2b. 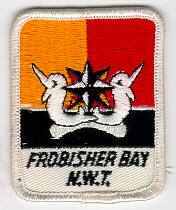 Swiss, Rolled edge, Rectangular; "FROBISHER BAY N.W.T.". Frobisher Bay. Version F2a/1. 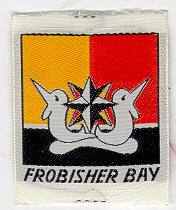 (unlisted) Ribbon, Strip, "1st Frobisher". Contemporary to, and worn with F1a. Frobisher Bay. Version F2a/2. 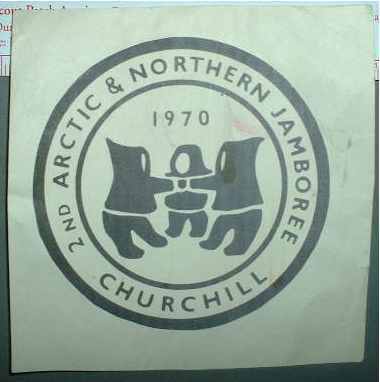 (unlisted) Ribbon, Strip, In Inuit syllabics "1 - Tasiujakjuaq". Contemporary to, and worn with F1a. 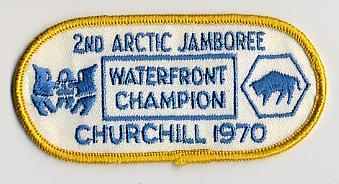 Tasiujakjuaq is the Inuit name for the body of water known as Frobisher Bay. Fort Simpson. Version F3a. Swiss, Cut edge, Curved strip. Fort Smith. Version F4x. (unlisted) Ribbon, Strip; "1st FORT SMITH". Great Slave Lake Region. Version G1a. Swiss, Cut edge, Irregular 68mm x 53mm; Blue lettering. Great Slave Lake Region. Version G1a. Swiss, Cut edge, Irregular 68mm x 53mm; Blue black lettering. Accidentally manufactured by B&S instead of the "d" version in 1989 and returned. 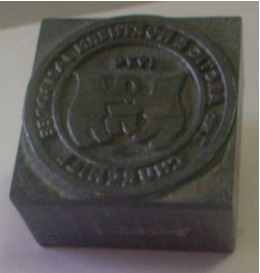 The stock was eventually purchased by the Territorial Scout Shop and made its way into general circulation. Great Slave Lake Region. Version G1b. Swiss, Cut edge, Irregular 70mm x 48mm; Gold lettering, Stitched outline on bottom of animal. Great Slave Lake Region. Version G1c. Swiss, Cut edge, Irregular 70mm x 48mm; Gold lettering, No stitching on bottom of animal. Great Slave Lake Region. Version G1d. Swiss, Cut edge, Irregular 95mm x 30mm. In use from 1990 to present. 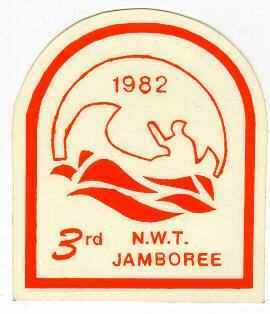 The original badge was issued for the Great Slave Lake District Jamboree held in 1969. 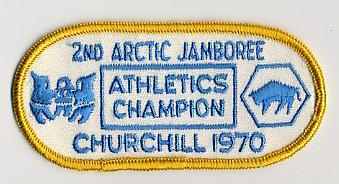 Presumably some leftovers from the Jamboree were used as district badges and subsequent re-orders of the badge resulted in the size variation and different thickness of letterring as well as the change from a plasticized mesh backing to a gauze backing. Holman. Version H1a. Swiss, Rolled edge, Circular; "ULUHAKTOK - HOLMAN NWT", Various shades of yellow, Variations in thickness of lettering. In use from 1985 to ? Igloolik. Version I1b. 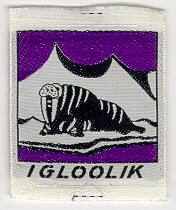 Ribbon, Strip; "IGLOOLIK". Inuvik Version I2a. Swiss, Cut edge, Rectangular, Unnamed; Yellow outlined igloo, building & tent on blue background. Inuvik. Version I2x. (unlisted) Ribbon, Strip. "INUVIK - PLACE OF MAN". Preceeds I2a. Inuvik. Version I2xx. (unlisted) Swiss, Rolled edge, Diamond. 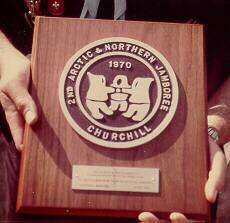 "1st INUVIK N.W.T. LAND OF THE MIDNIGHT SUN". Replaces I2a. Iqaluit. Version I3a. Swiss, Rolled edge, Rectangular; "Iqaluit, N.W.T.". Badge designed by : ? 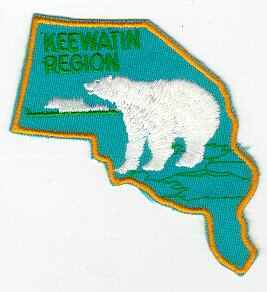 Keewatin Region. Version K1a. Swiss, Cut edge, Irregular; Left side is 40mm long, Various shades of blue background. 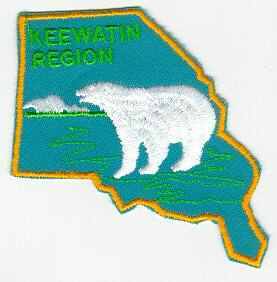 Keewatin Region. Version K1b. Swiss, Cut edge, Irregular; Left side is 55mm long. 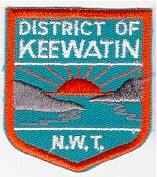 District of Keewatin. Version K2a. 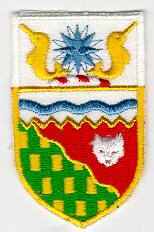 Swiss, Cut edge, Shield; "DISTRICT OF KEEWATIN N.W.T. ", Various shades of blue background. Extinct district absorbed by K1. Mackenzie Region. Version M1a. Swiss, Cut edge, Irregular; Antlers in brown, Various shades of blue background. Mackenzie Region. Version M1b. Swiss, Cut edge, Irregular; Antlers in white, Same shape as A issue. Mackenzie Region. Version M1c. Swiss, Cut edge, Irregular; Antlers in white, Different shape from A issue. Mackenzie. Version M2a. Swiss, Cut edge, Shield; "MACKENZIE N.W.T.". Extinct district absorbed by M3. 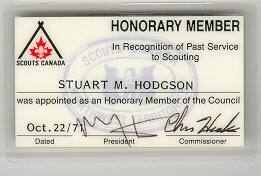 Issued under Alberta Scout Council. 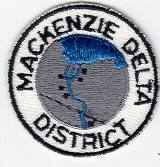 Mackenzie Delta District. Version M3a. Swiss, Cut edge, Circular; Six settlements (black dots). Extinct district absorbed by M1. 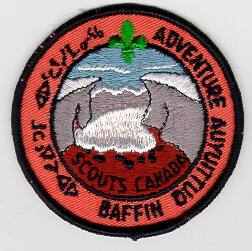 Issued under Alberta Scout Council. In use from 1969 to ? 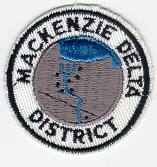 Mackenzie Delta District. Version M3b. Swiss, Cut edge, Circular; Eight settlements (black dots). Extinct district absorbed by M1. 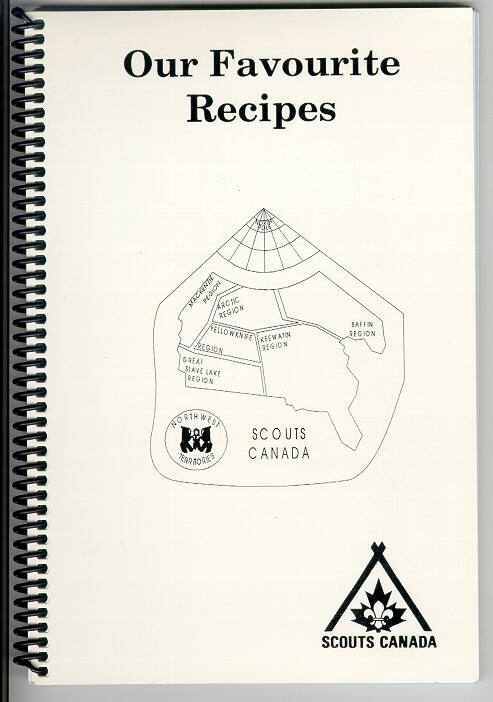 Issued under Alberta Scout Council. Norman Wells. Version N1a. Swiss, Cut edge, Curved strip. Nunavut. Version N2a. 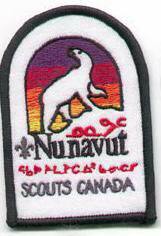 Swiss, Rolled edge, Irregular; "NUNAVUT SCOUTS CANADA and syllabics"
Scouting activities in Nunavut are administered from the National office. Nunavut. Version N2a/2. Error Issue. 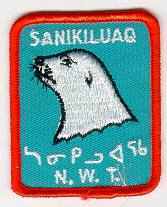 Swiss, Rolled edge, Irregular; "NUNAVUT SCOUTS CANADA and syllabics"
This badge with no North Star was a manufacturers error and not worn. Northern Region. Version ALTA N4a. Swiss, Cut edge, Circular; "NORTHERN REGION ALBERTA N.W.T. SASK. B.C." Pangnirtung. Version P1a. Swiss, Rolled edge, Rectangular; "Inuktitut syllabics PANGNIRTUNG N.W.T. ", Various shades of blue background, Various shades of orange border. Pangnirtung. Version P1b. 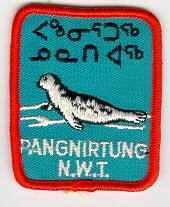 Ribbon, Strip, "1st PANGNIRTUNG". Precedes P1a, in use before 1978. Pine Point. Version P3a. 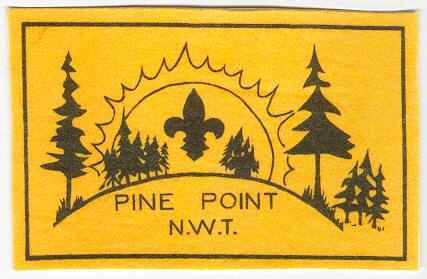 Silk screened on felt, Cut edge, Rectangular; "PINE POINT N.W.T. ", Variations in size of badge. Pine Point. Version P3a/1. (unlisted) Ribbon, Strip. "1st PINE POINT. Contemporary to and worn with P3a. Pine Point. Version P3x. (unlisted) Swiss, Rolled edge, Shield. "PINE POINT N.W.T." 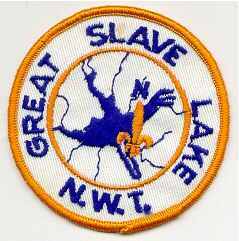 Badge never issued or worn by group. Qikiqtarjuaq. Version Q1a. (unlisted) Printed, Rolled edge, Square. 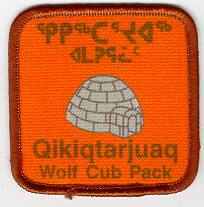 "Qikiqtarjuaq Wolf Cub Pack." Limited print run of 50 badges was shipped directly to the community. Qikiqtarjuaq. Version Q1b. (unlisted) Swiss, Rolled edge, Square. 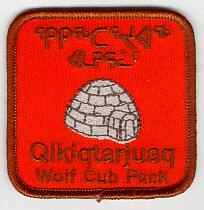 "Qikiqtarjuaq Wolf Cub Pack". Rankin Inlet. Version R1a. 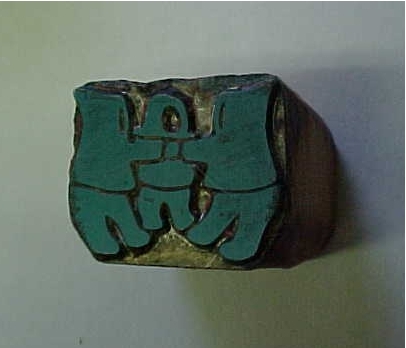 Swiss, Rolled edge, Irregular; "Inuktitut syllabics RANKIN INLET". Sanikiluaq. Version S1a. Swiss, Rolled edge, Rectangular; "SANIKILUAQ N.W.T. ", Various shades of blue background, Variations in size from 50mm x 60mm to 54mm x 64mm. Yellowknife Region. Version Y1a. 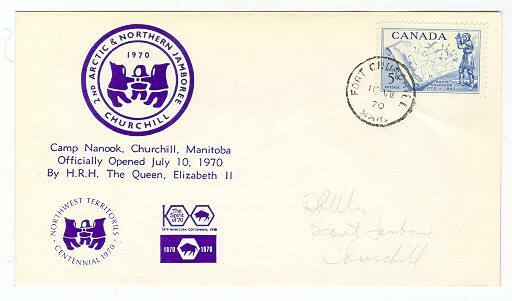 Swiss, Rolled edge, Irregular; "YELLOWKNIFE REGION N.W.T. SCOUTS". Yellowknife Region. Version Y1b. Swiss, Cut edge, Irregular; "YELLOWKNIFE REGION". Yellowknife. Version Y2a. 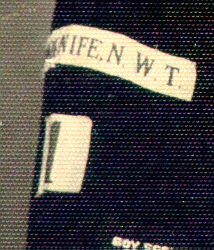 (unlisted) Ribbon, Strip; "YELLOWKNIFE N.W.T." Yellowknife Group Number. Version Y2a/1, 2. (unlisted) Ribbon, Square; "1", "2". These numbers were a generic issue, available across Canada. 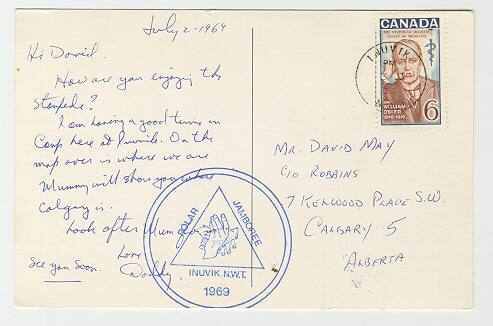 Yellowknife Group Letter. Version Y2a/a, b. (unlisted) Ribbon, Square; "A", "B". Worn with Y2a. 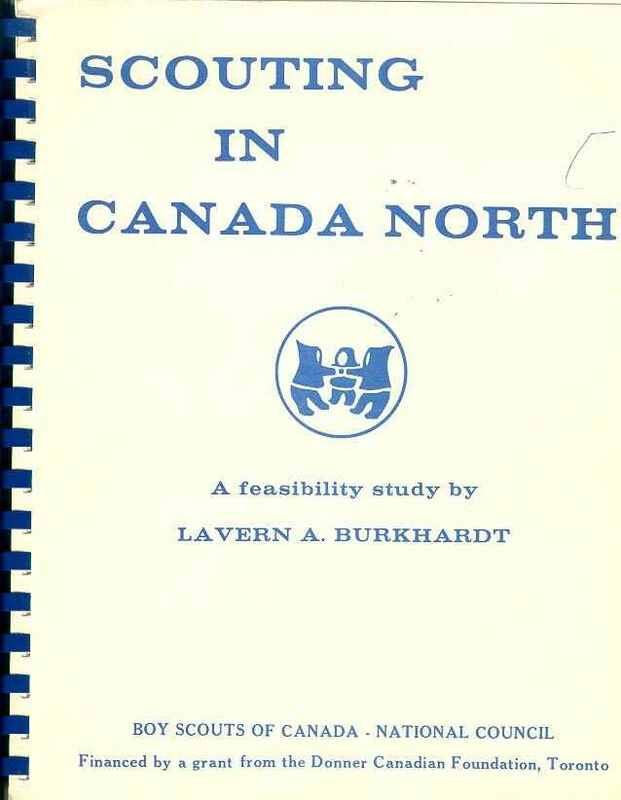 These letters were a generic issue, available across Canada. Yellowknife. Version Y2b/a. (unlisted) Swiss, Cut edge, Curved strip; "Yellowknife"
Yellowknife. Version Y2b/b. (unlisted) Swiss, Cut edge, Curved strip; "Yellowknife"
Yellowknife Group Number. Version Y2b/1, 2, 3, 4, 5. (unlisted) Swiss, Cut edge, Square; "1", "2", "3", "4", "5". Worn with Y2b. 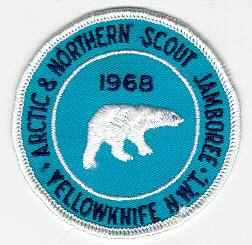 Yellowknife Group badge. Version Y2c/01a. (unlisted) Swiss, cut edge, Irregular; "YELLOWKNIFE 1"
Yellowknife Group badge. Version Y2c/01b. 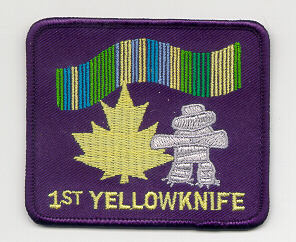 (unlisted) Swiss, rolled edge, Rectangular; "1ST YELLOWKNIFE"
Yellowknife Group badge. Version Y2c/02. 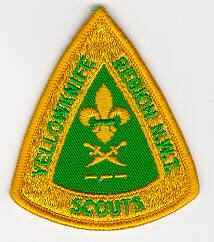 (unlisted) Swiss, cut edge, Irregular; "YELLOWKNIFE 2"
Yellowknife Group badge. Version Y2c/03. 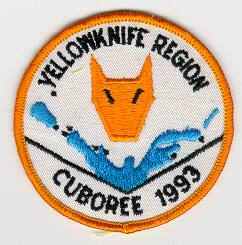 (unlisted) Swiss, cut edge, Irregular; "YELLOWKNIFE 3"
Yellowknife Group badge. Version Y2c/04. 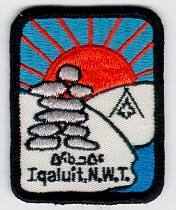 (unlisted) Swiss, cut edge, Irregular; "YELLOWKNIFE 4"
Yellowknife Group badge. Version Y2c/05. 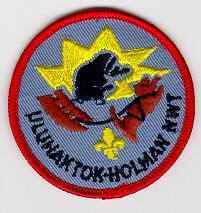 (unlisted) Swiss, cut edge, Irregular; "YELLOWKNIFE 5"
Yellowknife Group badge. Version Y2c/06. 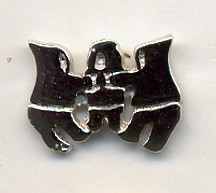 (unlisted) Swiss, cut edge, Irregular; "YELLOWKNIFE 6"
Yellowknife Group badge. Version Y2c/07. (unlisted) Swiss, cut edge, Irregular; "YELLOWKNIFE 7"
Yellowknife Group badge. Version Y2c/08. 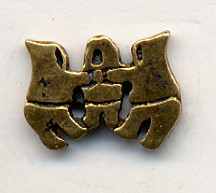 (unlisted) Swiss, cut edge, Irregular; "YELLOWKNIFE 8"
Yellowknife Group badge. Version Y2c/09. (unlisted) Swiss, cut edge, Irregular; "YELLOWKNIFE 9"
Yellowknife Group badge. Version Y2c/10. (unlisted) Swiss, cut edge, Irregular; "YELLOWKNIFE 10"
1st Territorial Camp. 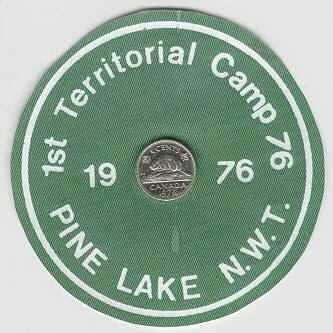 (unlisted) Printed cloth, Circular with 1976 dated nickel glued in center; "1st Territorial Camp 76 1976 Pine Lake N.W.T." 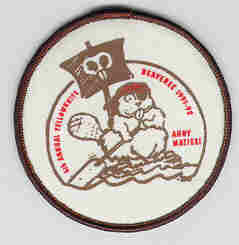 This badge was also issued as a Girl Guide Badge for an event at the same time. 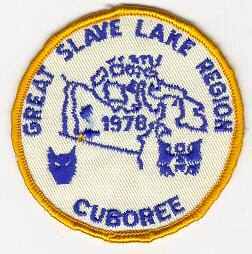 Great Slave Region Cuboree. 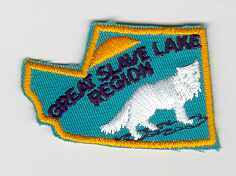 (unlisted) Swiss, Rolled edge, Circular; "GREAT SLAVE LAKE REGION CUBOREE 1978". Midnight Sun Cub Camp. 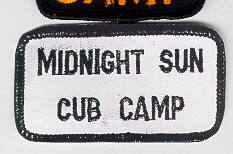 (unlisted) Silk screened on cloth, Rolled edge, Rectangular; "MIDNIGHT SUN CUB CAMP". Date uncertain for this Inuvik Cuboree. 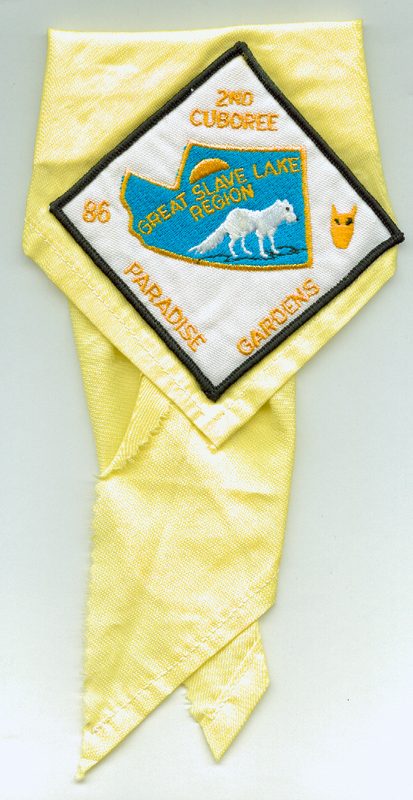 Worn with Generic Cub Camp badge. 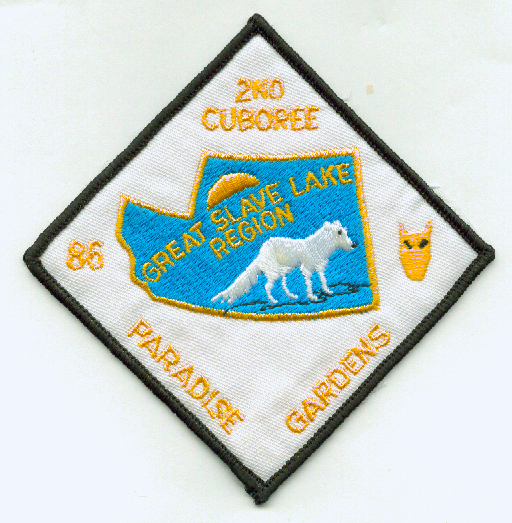 "2ND CUBOREE GREAT SLAVE LAKE REGION PARADISE GARDENS". Yellowknife Region Beaveree, 1987. 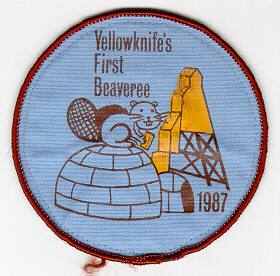 (unlisted) Silk screened on cloth, Rolled edge, Circular; "Yellowknife's First Beaveree 1987". Was there an event this year? 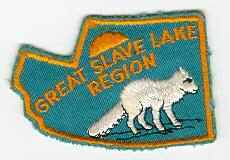 Was a badge issued for this event? Yellowknife Region Kub Kar Rally, 1988. 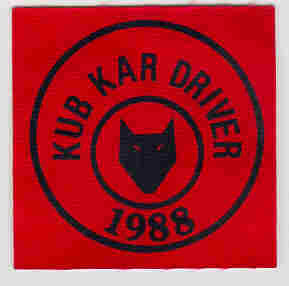 (unlisted) Silk screened on cloth, Square; "KUB KAR DRIVER". 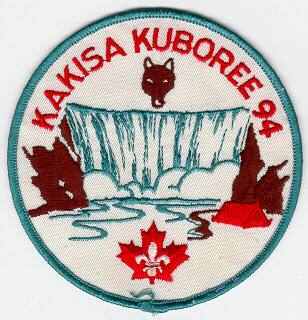 So far this is the only badge that has surfaced from Yellowknife Kub Kar Rallies. Yellowknife Region Beaveree, 1988. 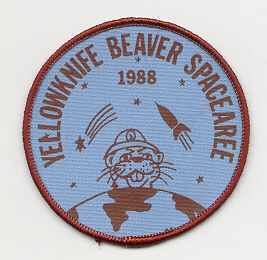 (unlisted) Silk screened on cloth, Rolled edge, Circular: "YELLOWKNIFE BEAVER SPACEAREE 1988"
Yellowknife Region Beaveree, 1989. 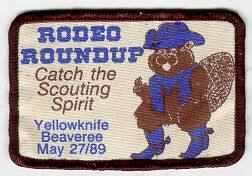 (unlisted) Silk screened on cloth, Rolled edge, Rectangular; "RODEO ROUNDUP Catch the Scouting Spirit Yellowknife Beaveree, May 27 / 89"
Yellowknife Region Cuboree, 1990. 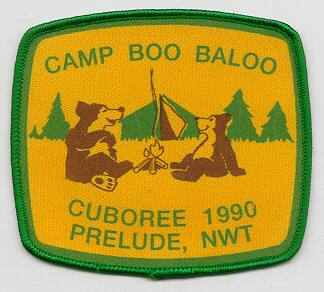 (unlisted) Silk screened on cloth, Rolled edge, Irregular, "CAMP BOO BALOO CUBOREE 1990 PRELUDE, NWT". Yellowknife Region Beaveree, 1991. 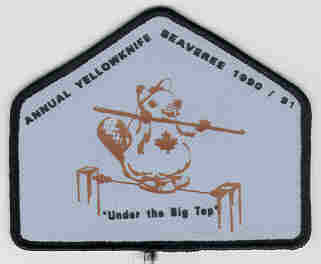 (unlisted) Silk screened on cloth, Rolled edge, Irregular; "ANNUAL YELLOWKNIFE BEAVEREE 1990 / 91 'Under the Big Top' ". 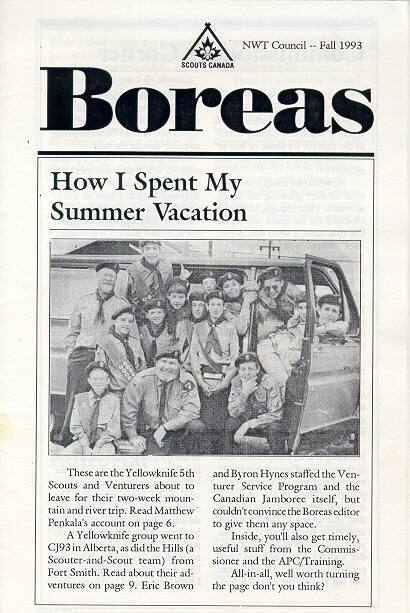 Yellowknife Region Cuboree, 1991. 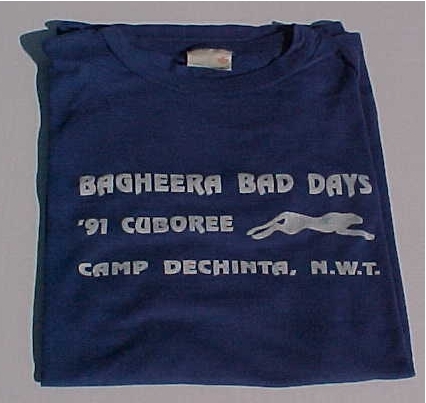 (unlisted) Silk screened on cloth, Rolled edge, Rectangular; "Bagheera's Bad Days, ' 91 Cuboree Camp Dechinta". 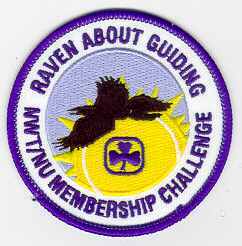 Badge designed by: Eric Brown? 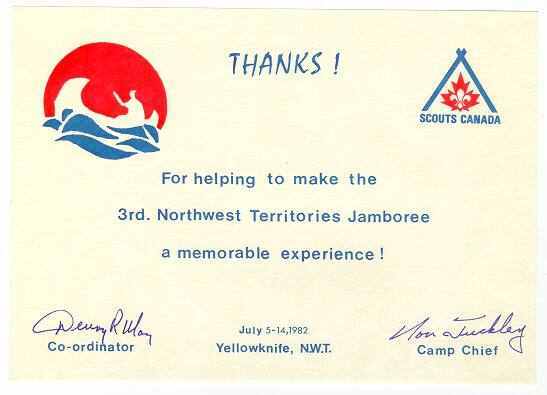 Yellowknife Region Cuboree, 1992. 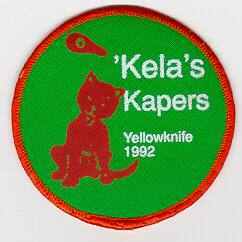 (unlisted) Silk screened on cloth, Rolled edge, Circular; "'Kela's Capers Yellowknife 1992". 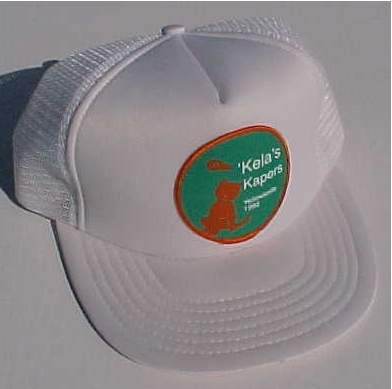 Yellowknife Region Cuboree, Kela's Capers Cap. A great idea, to issue all the participants a white hat in an event that took place in Prelude Lake Park, where the sand is 50% ash from an old forest burn. Within the first five minutes, most hats were well-adorned with black fingerprints. This near spotless example was found in a local flea market 9 years after the Cuboree. Yellowknife Region Beaveree, 1993. 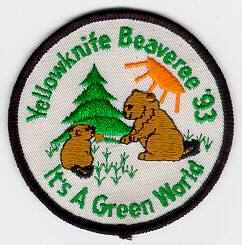 (unlisted) Swiss, Rolled edge, Circular; "Yellowknife Beaveree ' 93 It's A Green World". Yellowknife Region Cuboree, 1993. 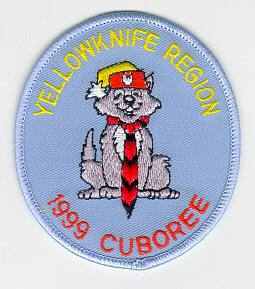 (unlisted) Swiss, Rolled edge, Circular; "YELLOWKNIFE REGION CUBOREE 1993". Yellowknife Region Cuboree, 1994. (unlisted) Swiss, Rolled edge, Circular; "KAKISA CUBOREE 94". Yellowknife Region Beaveree, 1994. (unlisted) Swiss, Rolled edge, Circular; "8th BEAVEREE 1994 20 YEARS OF BEAVERING". Yellowknife Region Cuboree, 1999. 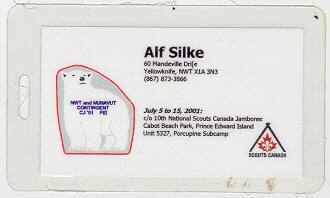 (unlisted) Swiss, Rolled edge, Oval; "YELLOWKNIFE REGION 1999 CUBOREE". Council Challenge, 1972. (unlisted) Swiss, Rolled edge Rectangular; "WE DID IT! 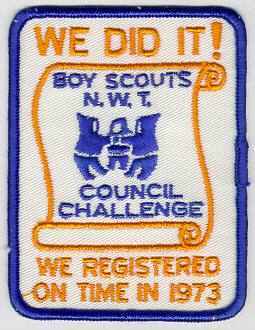 BOY SCOUTS N.W.T. COUNCIL CHALLENGE WE REGISTERED ON TIME IN 1972". 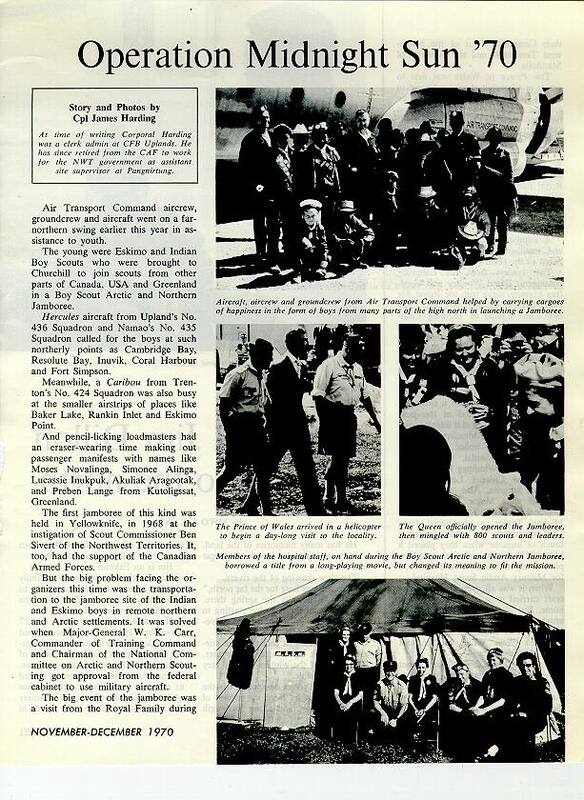 An incentive program was launched in 1972 and 1973 to actively encourage Scouting groups in isolated communities to officially register. 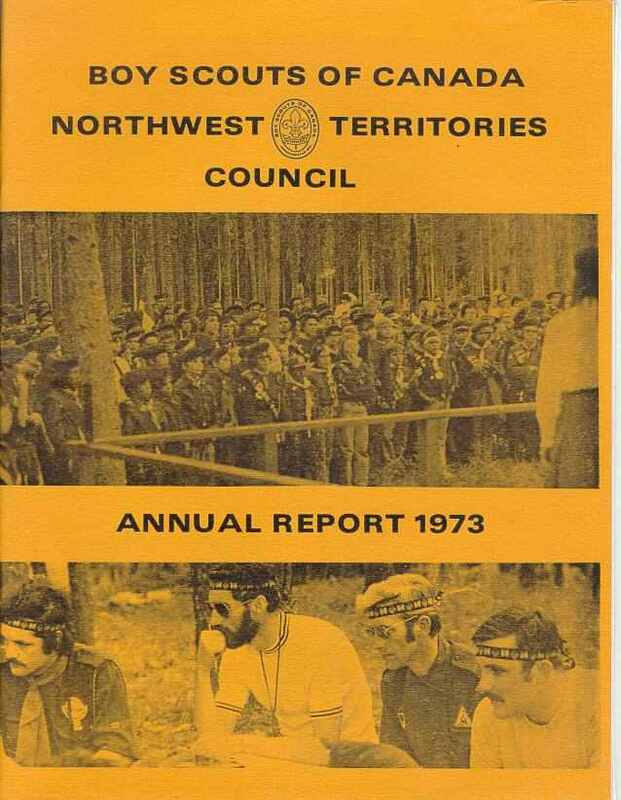 Council Challenge, 1973. 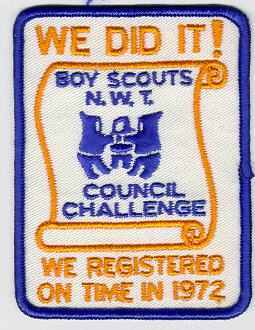 (unlisted) Swiss, Rolled edge Rectangular; "WE DID IT! 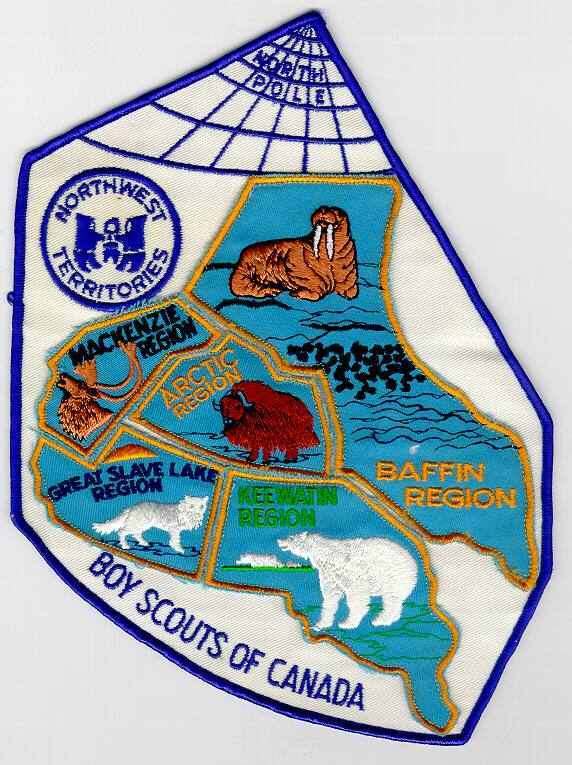 BOY SCOUTS N.W.T. COUNCIL CHALLENGE WE REGISTERED ON TIME IN 1973". 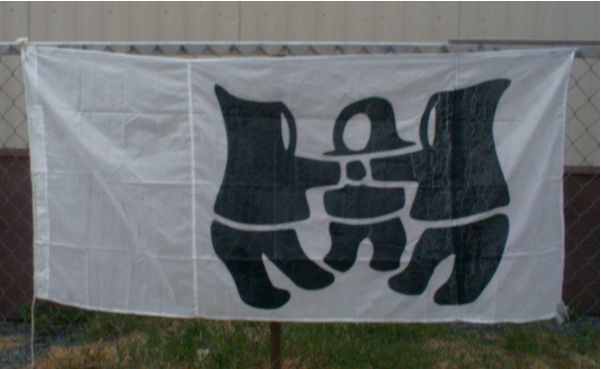 NWT Council Flag. This appears to be a home-made flag. No details are available to the date and use for this flag. 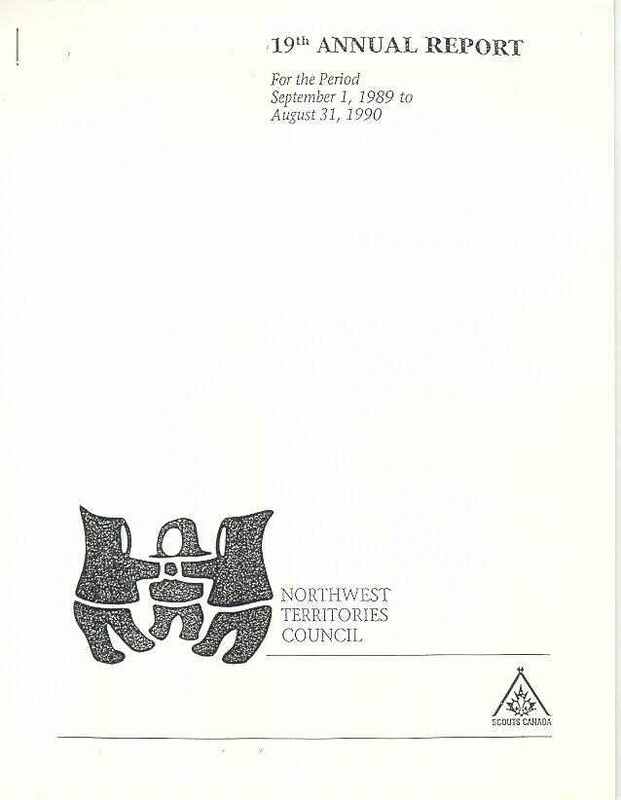 Framed Card: Official Emblem presented to all sitting members of Council, on April 29, 1972 - signed by Stuart Hodgson, Commissioner of the Northwest Territories. 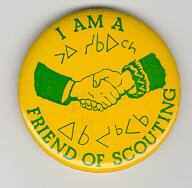 These buttons were produced and sold by Frobisher Bay Scouts under the leadership of Frido Profoehr as a Group fund-raiser. Language Strip, I Speak Chipewyan. (unlisted) Swiss, Cut edge, Rectangular. Variations in width from 90mm to 95mm. 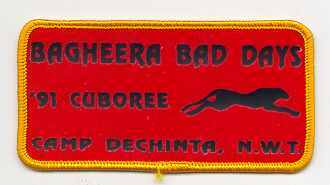 The Chipewyan script says "I speak English"
Language Strip, I Speak Dogrib. (unlisted) Swiss, Cut edge, Rectangular. Variations in width from 90mm to 95mm. 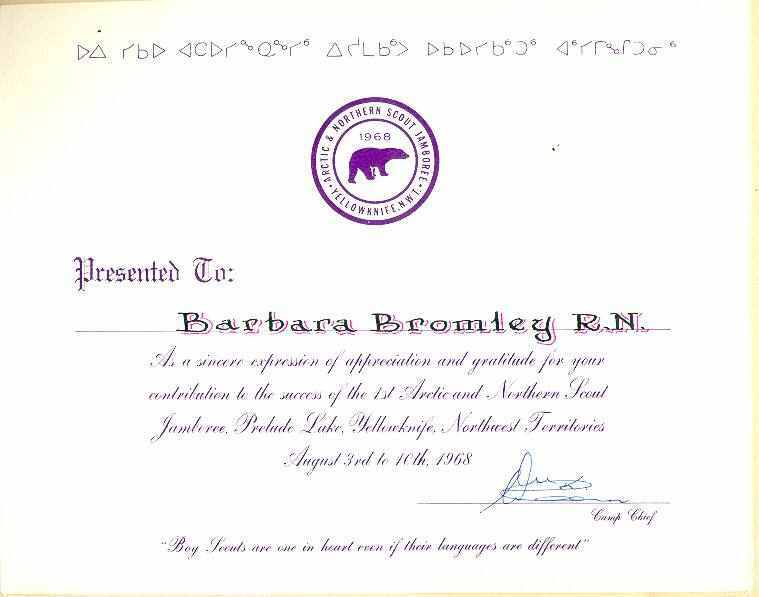 The Dogrib script says "I speak English"
Language Strip, I Speak Eskimo (in orthographics). (unlisted) Swiss, Cut edge, Rectangular. Variations in width from 90mm to 95mm. 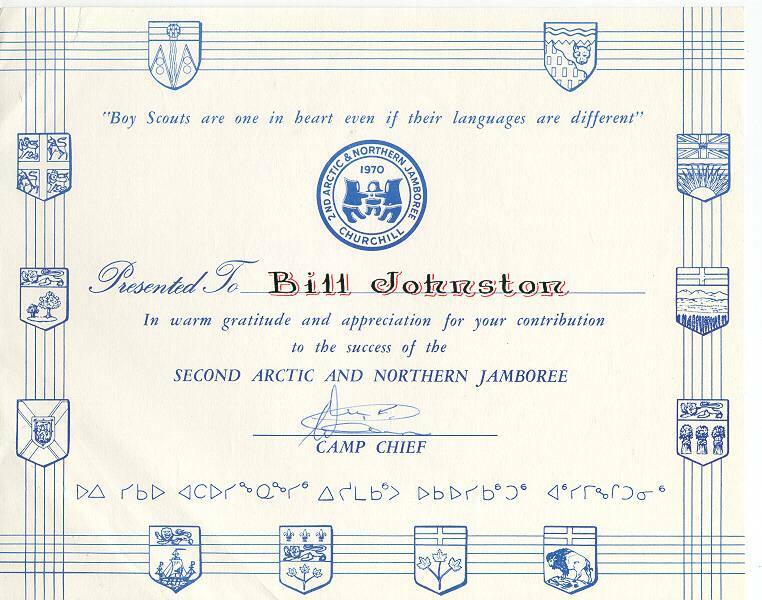 The Inuktitut script says "I speak English"
Language Strip, I Speak Eskimo (in syllabics). (unlisted) Swiss, Cut edge, Rectangular. Variations in width from 90mm to 95mm. Language Strip, I Speak Inuktitut (in orthographics). (unlisted) Swiss, Cut edge, Rectangular. Variations in width from 90mm to 95mm. Language Strip, I Speak Inuktitut (in syllabics). (unlisted) Swiss, Cut edge, Rectangular. Variations in width from 90mm to 95mm. Language Strip, I Speak Loucheux. (unlisted) Swiss, Cut edge, Rectangular. Variations in width from 90mm to 95mm. The Loucheux script says "I speak English"
Language Strip, I Speak Slavey. (unlisted) Swiss, Cut edge, Rectangular. Variations in width from 90mm to 95mm. 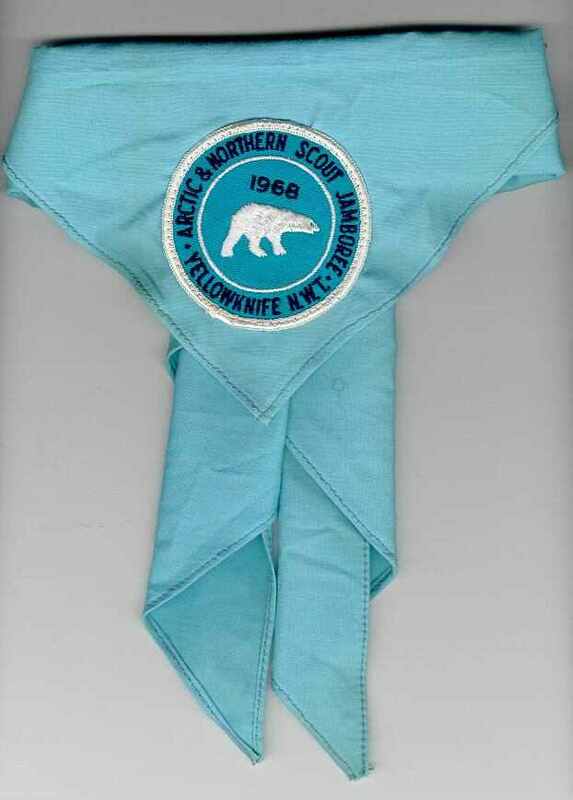 The Slavey script says "I speak English"
NWT Council Necker, worn by Service Scouters. 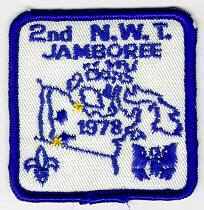 The necker was also used as the NWT Contingent necker for the 1st NWT Jamboree in 1973 and for the Canadian Jamboree in 1977. Pin manufacturers are more than willing to supply colour variations. The following pins are all "one of a kind". NWT Council Spoon. 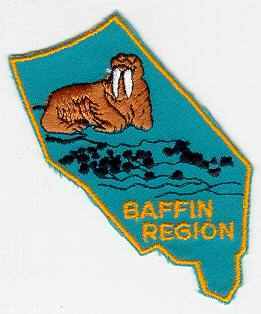 Introduced in 1987. 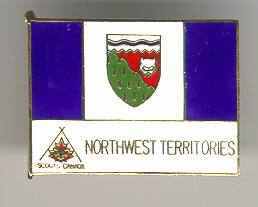 NWT Flag Pin (from a set of Provincial and Teritorial Flag Pins that was issued by the National Council during the 1980's. 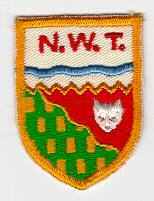 NWT Map Badge. Version Misc 4a/1. 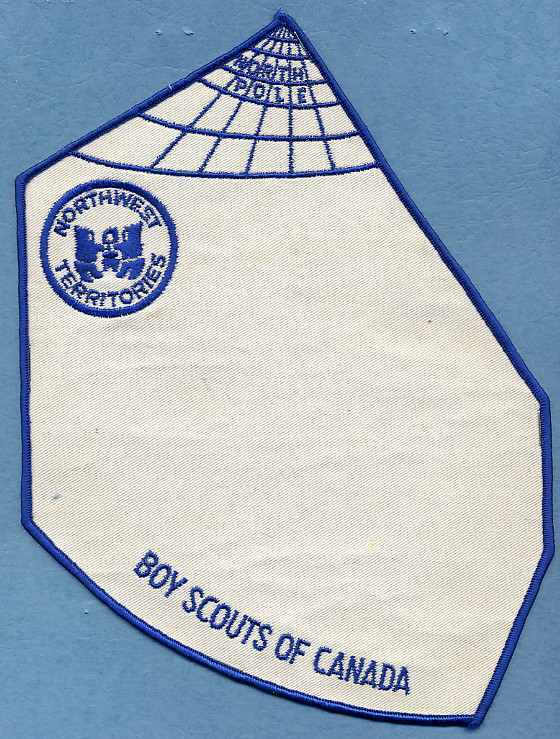 (unlisted) Swiss, Rolled edge, Irregular;"NORTH POLE BOY SCOUTS OF CANADA NORTHWEST TERRITORIES", Northwest Territories in a circle shape, Blue lettering & border. 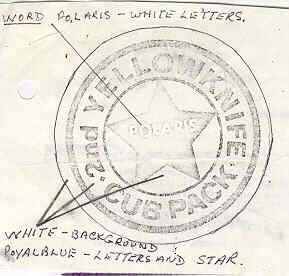 Blank as received from manufacturer. Only 1 known to be in existence. 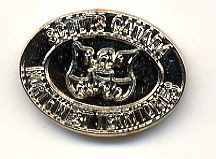 (This is the original state of the badge as received from B&S Emblems. 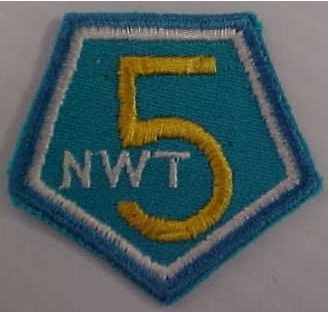 The five regional badges (see below) were sewn on in Edmonton by staff in the office of the Executive Director for the NWT Council). 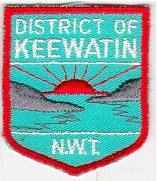 NWT Map Badge. Version Misc 4a. Swiss, Rolled edge, Irregular; Badges A1a, G1a, K1a, M1a, & MISC.3a. 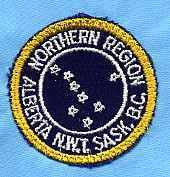 sewn on back piece, "NORTH POLE BOY SCOUTS OF CANADA NORTHWEST TERRITORIES", Northwest Territories in a circle shape, Blue lettering & border. 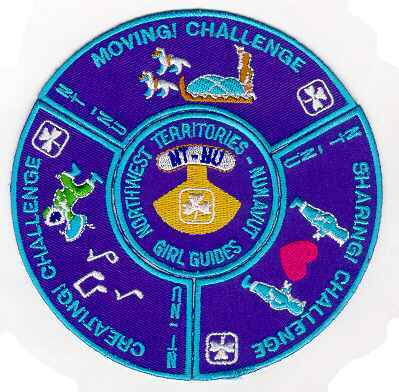 NWT Map Badge. Version Misc 4b. 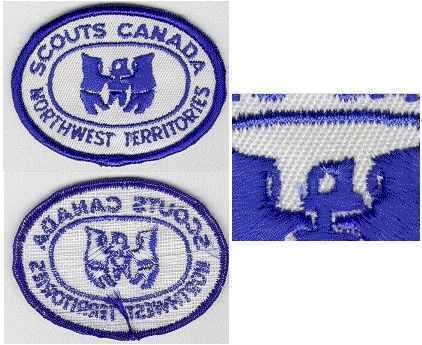 Swiss, Rolled edge, Irregular; 5 badges embroidered onto back piece, "NORTH POLE SCOUTS CANADA NORTHWEST TERRITORIES", Northwest Territories in a circle shape, Blue lettering & border. 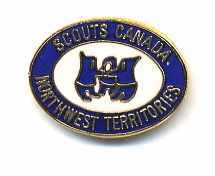 NWT Map Badge. Version Misc 4c. 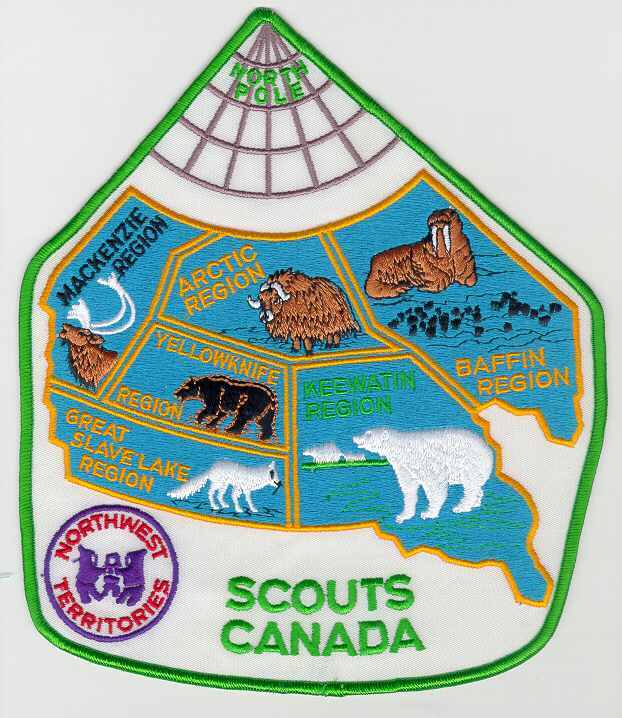 Swiss, Rolled edge, Irregular; 6 badges embroidered onto back piece, "NORTH POLE SCOUTS CANADA NORTHWEST TERRITORIES", Northwest Territories in a circle shape, Various colors of border, Various colors of lettering. 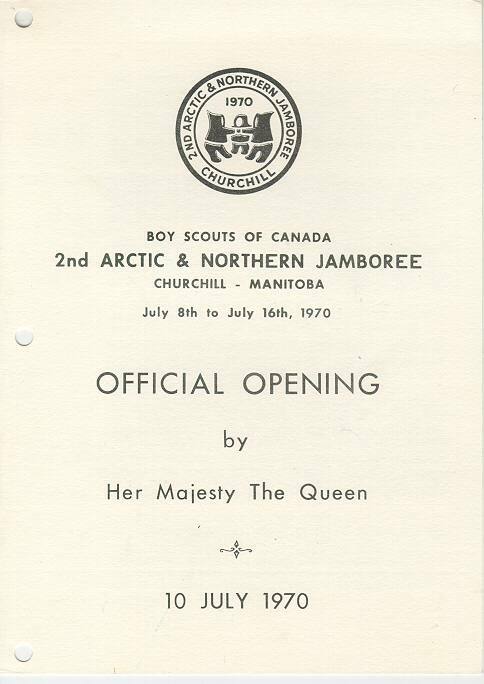 Red lettering for Scouts Canada and North Pole, green lettering for Northwest Territories and green bordered version. 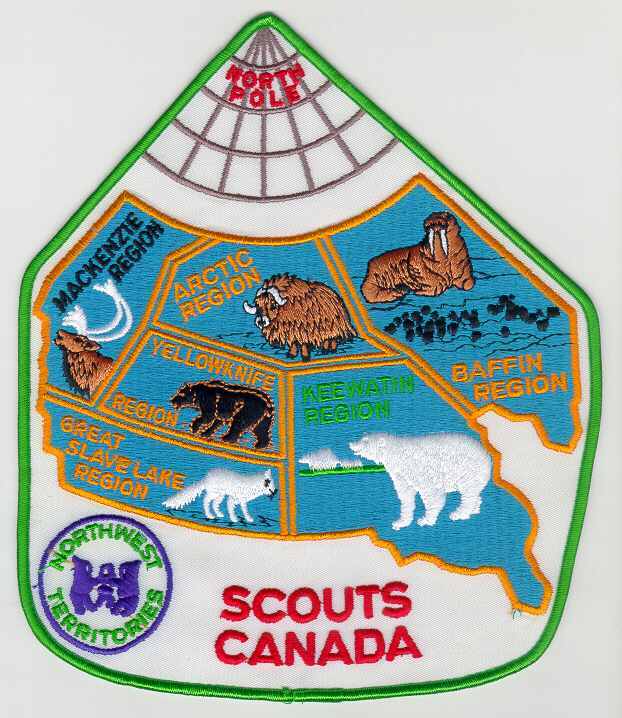 Green lettering for Scouts Canada, North Pole and Northwest Territories and green bordered version. Orange lettering for Scouts Canada and North Pole, purple lettering for Northwest Territories and gold bordered version shown. 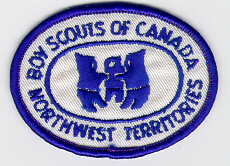 Purple lettering for Scouts Canada and North Pole, red lettering for Northwest Territories and green bordered version. 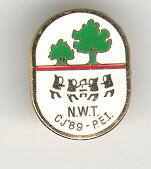 "NWT Map Badge. Version Misc 4d. 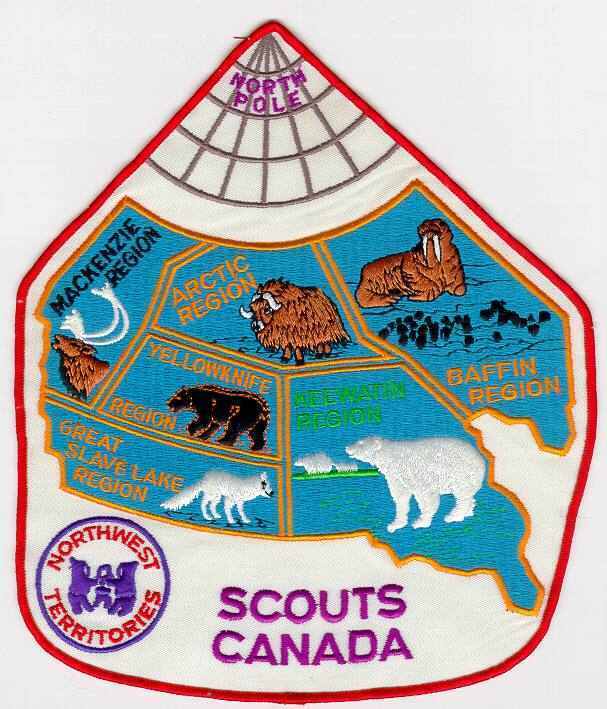 Swiss, Rolled edge, Irregular; 6 badges embroidered onto back piece, ""NORTH POLE SCOUTS CANADA SCOUTS CANADA NORTHWEST TERRITORIES"", Scouts Canada Northwest Territories in an oval shape." NWT Ribbon. 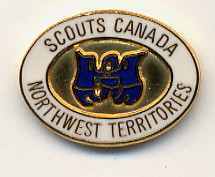 (unlisted) Ribbon, Rectangular; "SCOUTS CANADA NORTHWEST TERRITORIES". 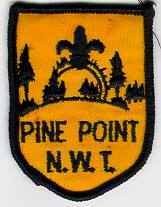 NWT Wood Badge, 1978. (unlisted) Swiss, Rolled edge, Circular; "N.W.T. 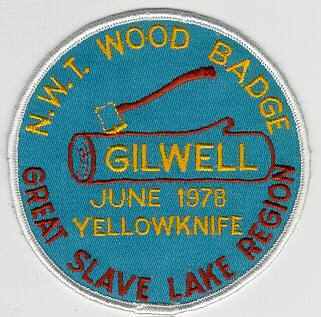 WOOD BADGE GILWELL JUNE 1978 YELLOWKNIFE GREAT SLAVE LAKE REGION". 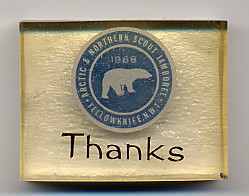 NWT Wood Badge. (unlisted) Swiss, Rolled edge, Circular; "N.W.T. 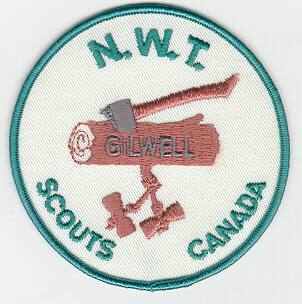 GILWELL SCOUTS CANADA". 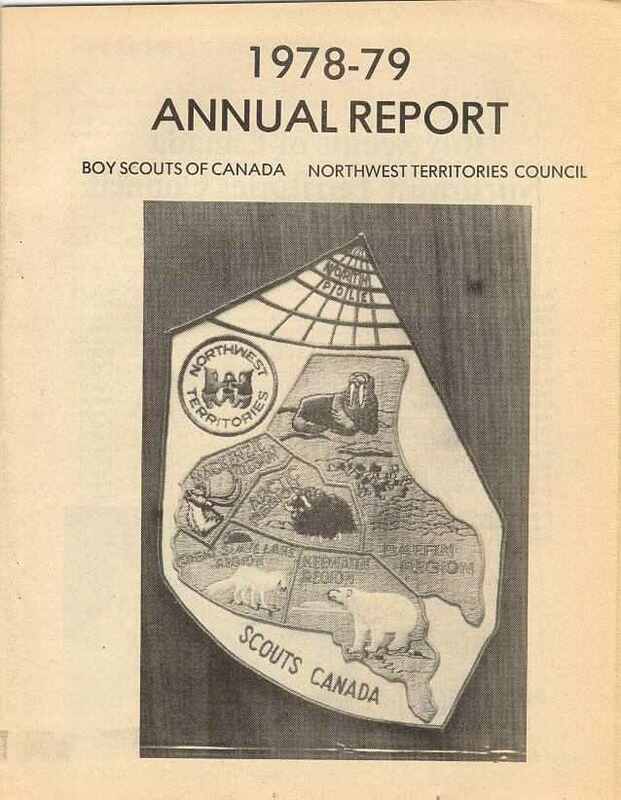 Paperweight: "BOY SCOUTS OF CANADA N.W.T. COUNCIL". 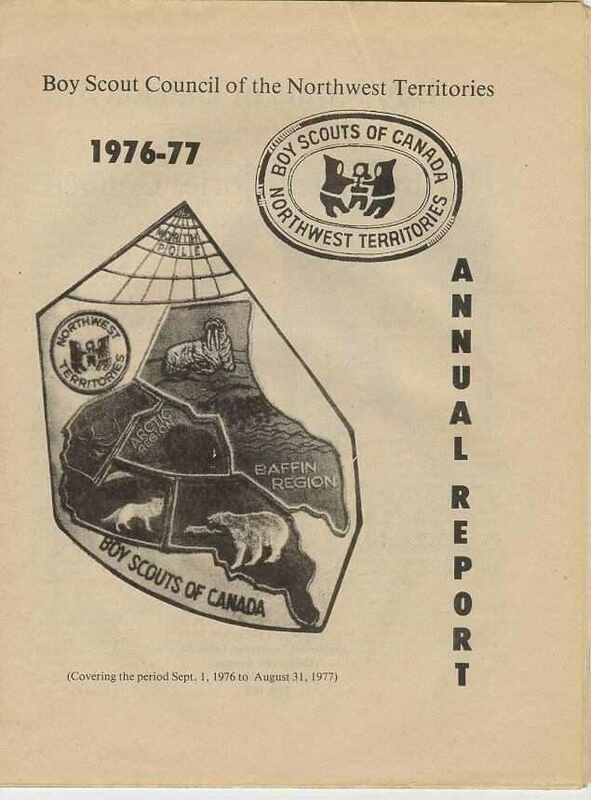 Paperweight: "SCOUTS CANADA NORTHWEST TERRITORIES". Pen Pal Award. 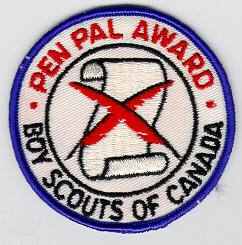 (unlisted) Swiss, Rolled edge, Circular; "PEN PAL AWARD BOY SCOUTS OF CANADA". 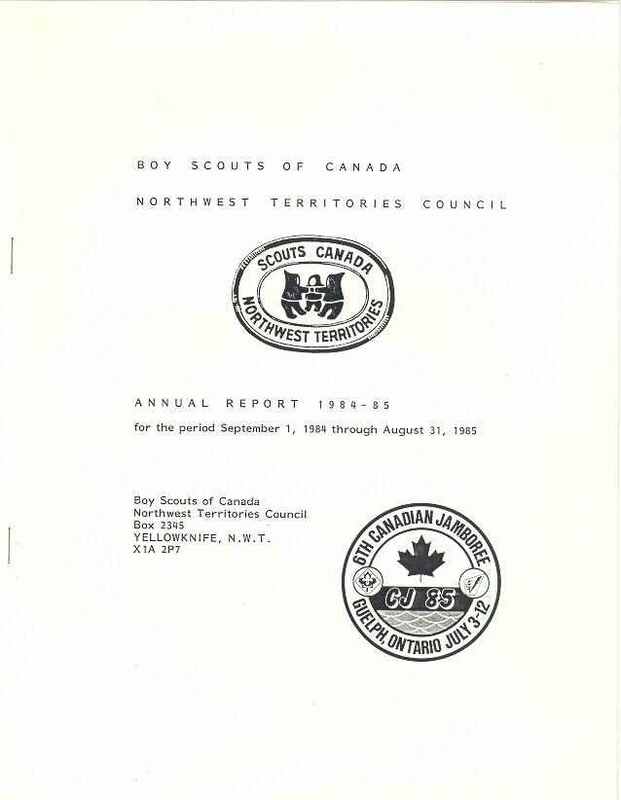 Part of a program initiated by the Committee on Northern Scouting in the late 60's to actively encourage communications between isolated Northern Scouting groups and their southern counterparts. 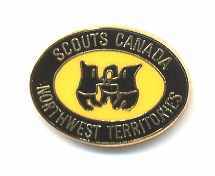 This was the badge which was given to the to Scouts who maintained communication with a Scout from another group in Northern or Southern Canada. 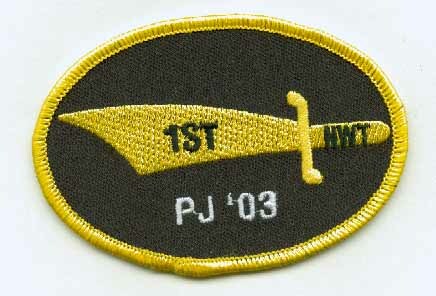 Recruiter badge. (unlisted) Swiss, Cut edge, Rectangular; "RECRUITER". 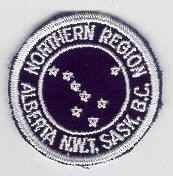 Northern Region (Alberta) & the N.W.T. 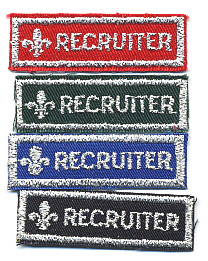 Scout Council introduced a set of recruiter badges for use within the Region to promote recruitment of members (youth or adult). 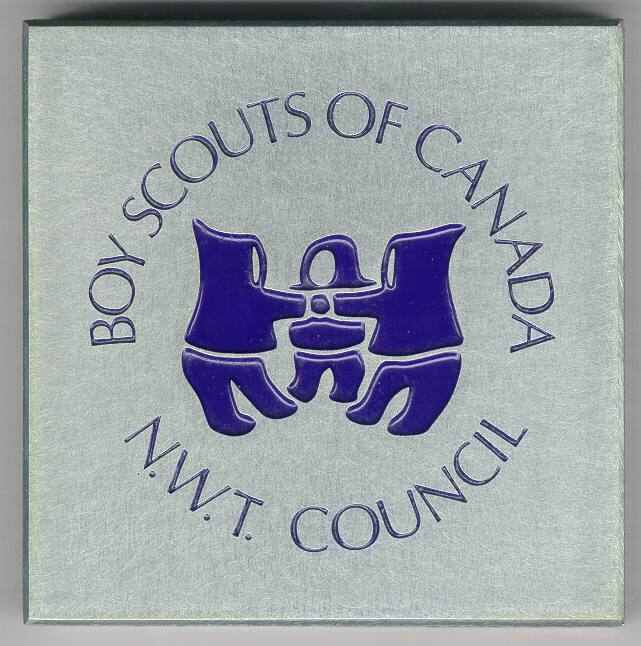 The NWT Scout Council used Silver on Green for youth members, Silver on Black for Scouters. 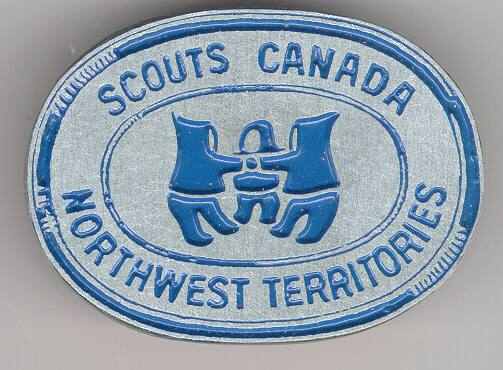 The Northern Region used Silver on Blue for recruiting 1 new member, Silver on Red for recruiting 5 new members. 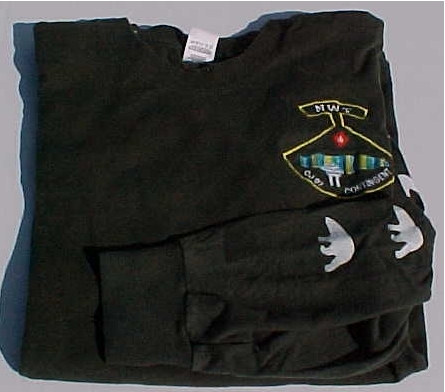 They were worn on the left uniform pocket. Twinning Award, small. 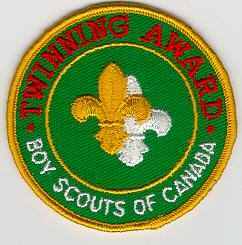 (unlisted) Swiss, Rolled edge, Circular 75mm dia; "TWINNING AWARD BOY SCOUTS OF CANADA". 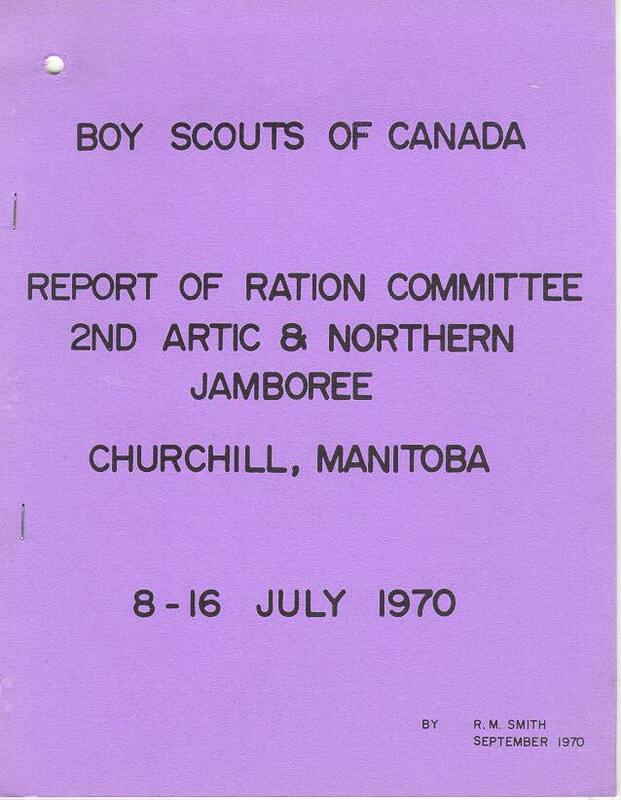 Part of a program initiated by the Committee on Northern Scouting in the late 60's to actively encourage communications between isolated Northern Scouting groups and their southern counterparts. 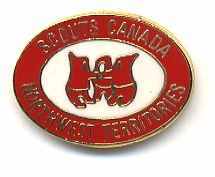 This was the badge which was given to the individual Scouts of any group for twinning with another group in Northern or Southern Canada. Twinning Award, large. 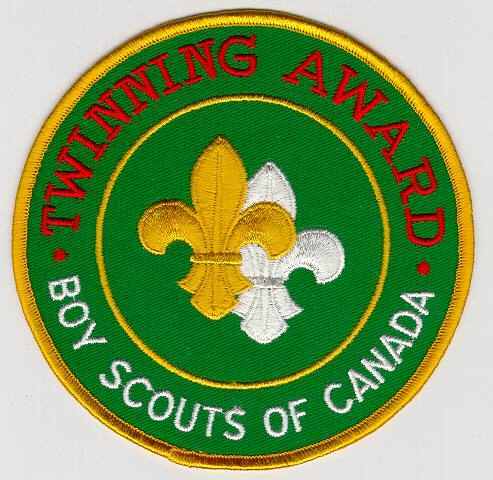 (unlisted) Swiss, Rolled edge, Circular 160mm dia; "TWINNING AWARD BOY SCOUTS OF CANADA". 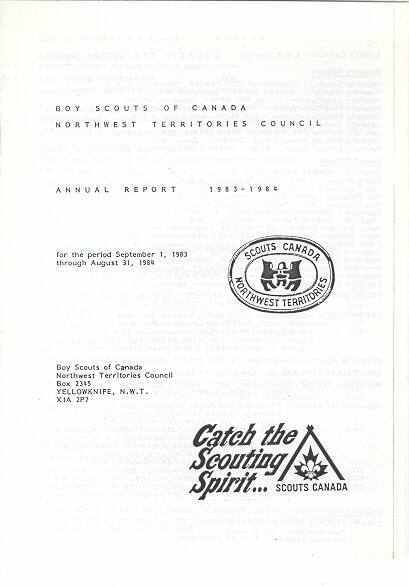 Part of a program initiated by the Committee on Northern Scouting in the late 60's to actively encourage communications between isolated Northern Scouting groups and their southern counterparts. 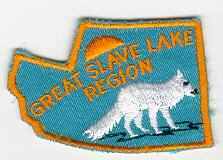 This was the badge which was given to the to the group as a flag badge for twinning with another group in Northern or Southern Canada. 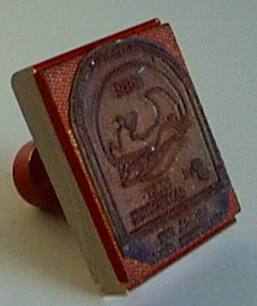 Stamp (for sealing wax?) 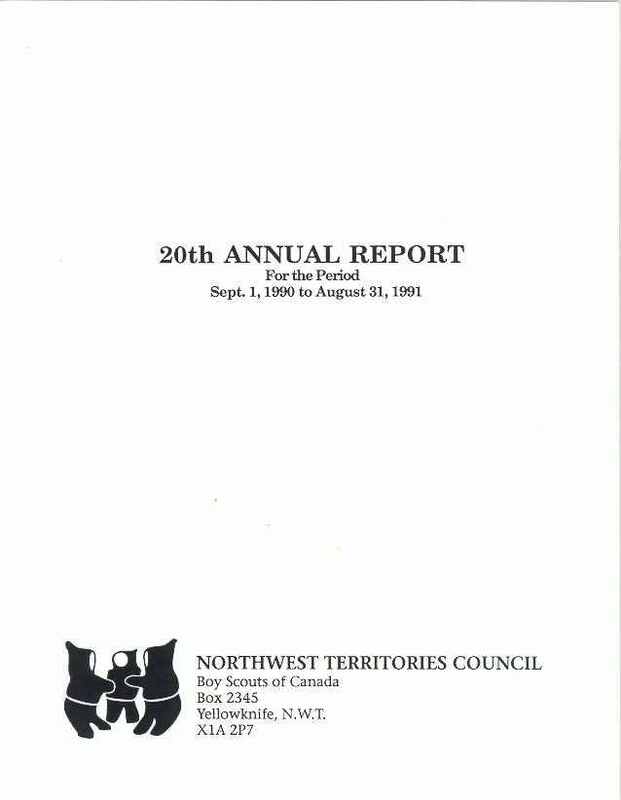 "NORTHWEST TERRITORIES"
Bowman. (unlisted) Swiss, Rolled edge, Triangular; un-named. Germ Enemy. (unlisted) Swiss, Rolled edge, Triangular; un-named. Interpreter. (unlisted) Swiss, Rolled edge, Triangular; un-named. Komatik Driver. (unlisted) Swiss, Rolled edge, Triangular; un-named. Snowmobile Safety. (unlisted) Swiss, Rolled edge, Triangular; un-named. Waterboy. (unlisted) Swiss, Rolled edge, Triangular; un-named. 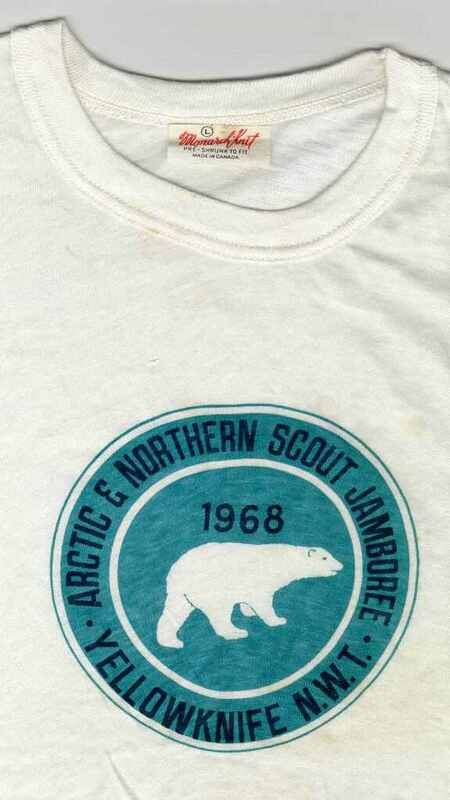 Poster: Arctic and Northern Cub and Scout Badges. Carver. (unlisted) Swiss, Rolled edge, Circular; un-named. Dog Driver. (unlisted) Swiss, Rolled edge, Circular; un-named. Fur Trapper. (unlisted) Swiss, Rolled edge, Circular; un-named. Hunter. (unlisted) Swiss, Rolled edge, Circular; un-named. Kayak Builder. (unlisted) Swiss, Rolled edge, Circular; un-named. Lamp Maker. (unlisted) Swiss, Rolled edge, Circular; un-named. Sewing. (unlisted) Swiss, Rolled edge, Circular; un-named. Skinner. (unlisted) Swiss, Rolled edge, Circular; un-named. Snowmobile Driver. (unlisted) Swiss, Rolled edge, Circular; un-named. 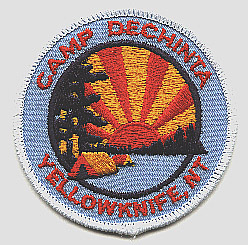 Camp Dechinta, located at Prelude Lake, is jointly operated by Guides and Scouts. 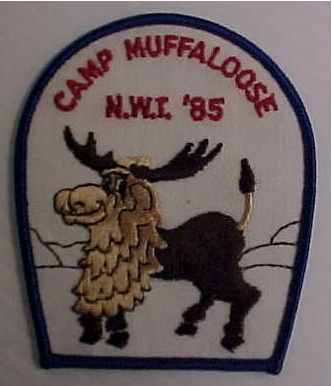 Camp Muffaloose. (unlisted) Swiss, Rolled edge, Irregular, 90 x 75mm; "CAMP MUFFALOOSE N.W.T. 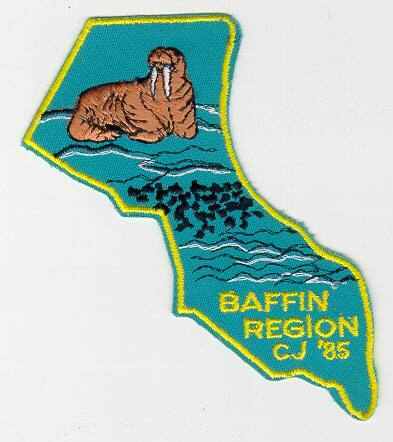 '85"
The Muffaloose is a fictional mascot of Fort Smith, so I assume this activity was held in the area. 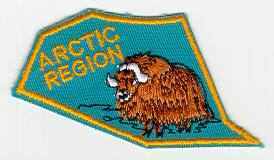 Central Arctic Division. 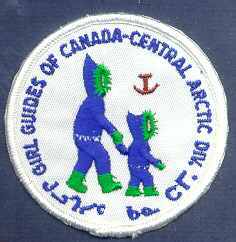 (unlisted) Swiss, Rolled edge; "GIRL GUIDES OF CANADA - CENTRAL ARCTIC DIV." 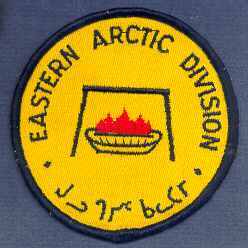 Eastern Arctic Division. 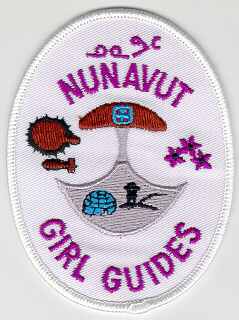 (unlisted) Swiss, Rolled edge; "EASTERN ARCTIC DIVISION"
Circular; "NORTHWEST TERRITORIES - NUNAVUT GIRL GUIDES NT-NU"
Irregular; "MOVING CHALLENGE NT-NU", SHARING CHALLENGE NT-NU" and CREATING CHALLENGE NT-NU"
Great Slave Division. 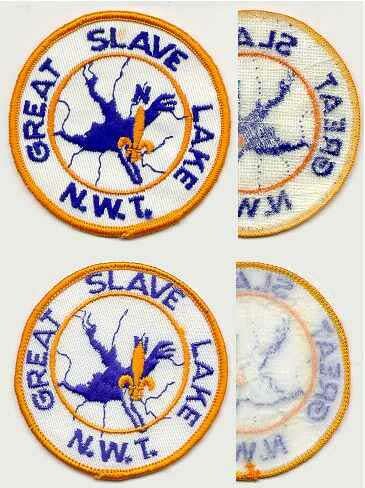 (unlisted) Swiss, Rolled edge, Circular; "GREAT SLAVE DIVISION"
Midnight Sun Division. 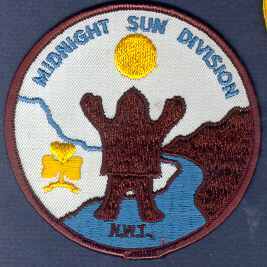 (unlisted) Swiss, Rolledge, Circular; "MIDNIGHT SUN DIVISION N.W.T." Millenium Challenge. 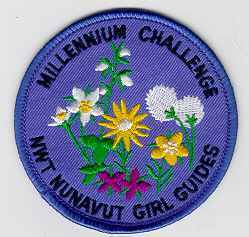 (unlisted) Swiss, Rolled edge, Circular; " MILLENNIUM CHALLENGE NWT NUNAVUT GIRL GUIDES"
NWT Council 5th Anniversary. (unlisted) Swiss, Cut edge, Irregular; " NWT 5"
Worn on the right cuff of the uniform from August 20, 1979 to July 1, 1980 by all members. Is this an actual Guide item or just coincidental that it has the blue sash or ribbon beneath the shield? 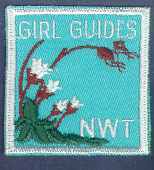 NWT Guide Badge. 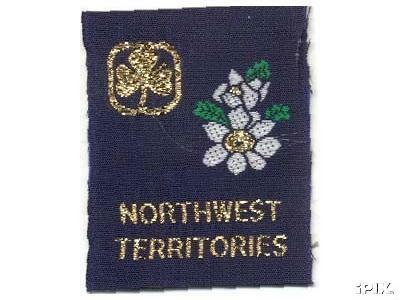 (unlisted) Swiss, Cut edge, Square; "GIRL GUIDES NWT"
NWT Guides Mountain Avens. 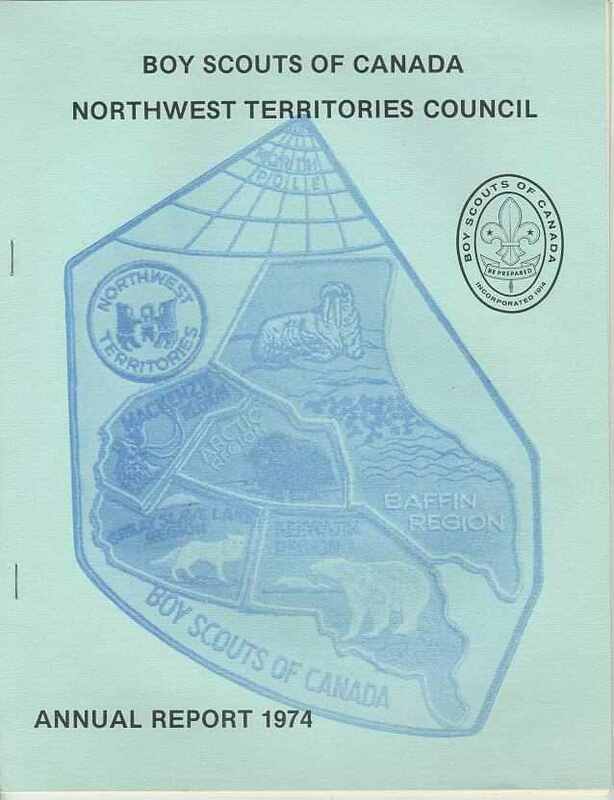 (unlisted) Ribbon, Rectangular; "NORTHWEST TERRITORIES"
NWT and Nunavut Guides. 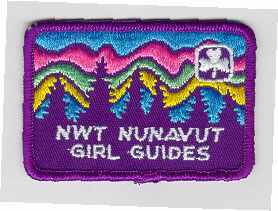 (unlisted) Swiss, Rolled edge, Rectangular; "NWT NUNAVUT GIRL GUIDES"
NWT and Nunavut Guides. 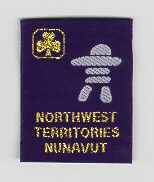 (unlisted) Ribbon, Rectangular; "NORTHWEST TERRITORIES NUNAVUT"
NWT and Nunavut Guides. 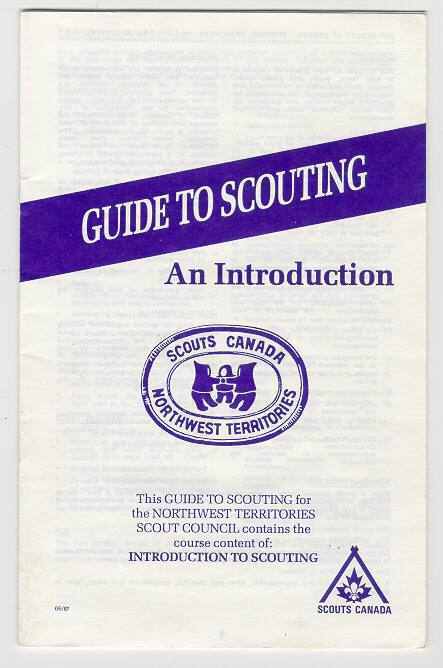 (unlisted) Swiss, Rolled edge, Round; "NORTHWEST TERRITORIES NUNAVUT"
Nunavut Guides. 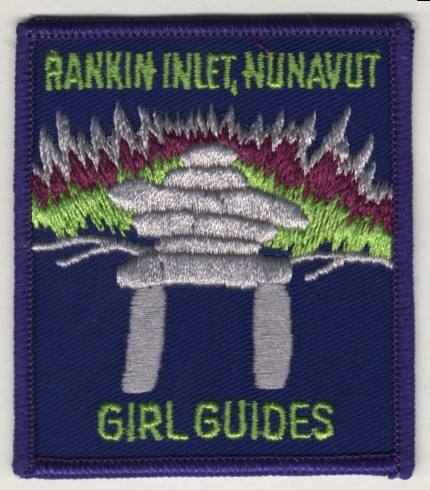 (unlisted) Swiss, Rolled edge, Oval; "NUNAVUT GIRL GUIDES"
Rankin Inlet Nunavut Guides. 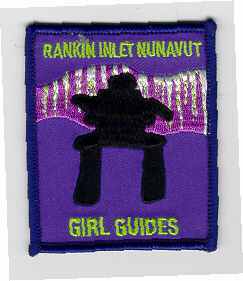 (unlisted) Swiss, Rolled edge, Rectangular; "RANKIN INLET NUNAVUT GIRL GUIDES"
NWT / NU MEMBERSHIP CHALLENGE"
Sash. Dog Team Silk Ribbon. History unknown. 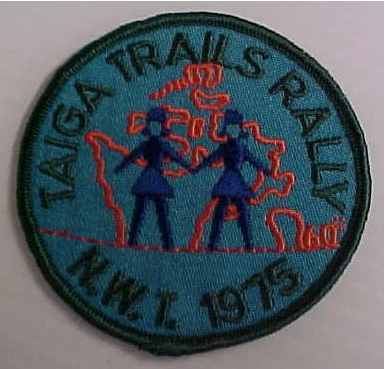 Taiga Trails Rally. (unlisted) Swiss, Rolled edge, Circular 80 mm dia; "TAIGA TRAILS RALLY N.W.T. 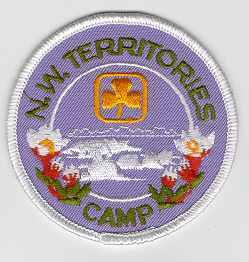 1975"
Territorial Camps (unlisted) Swiss, Rolled edge, Circular; "N.W. 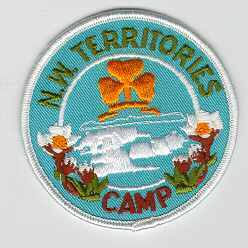 TERRITORIES CAMP"
Territorial Camps (unlisted) Swiss, Rolled edge, Circular; "N.W. TERRITORIES CAMP" Dark blue coloured version with Guide symbol in box. Ulu Pin. 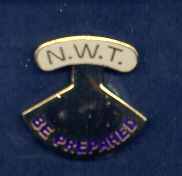 "NWT Be Prepared"
"Why Not Start a Scout Group?" 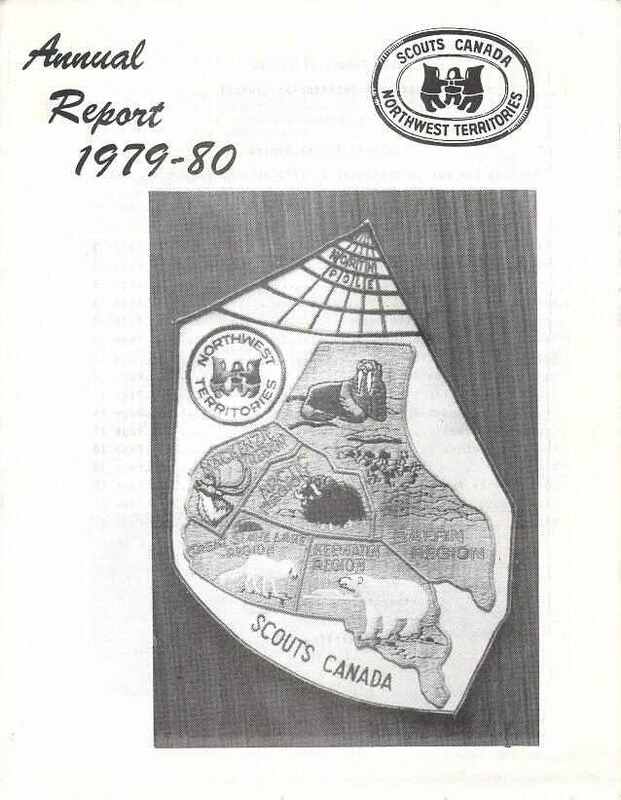 "Guide to Scouting for the Northwest Territories Scout Council"
"Scouting Badges from North of 60"